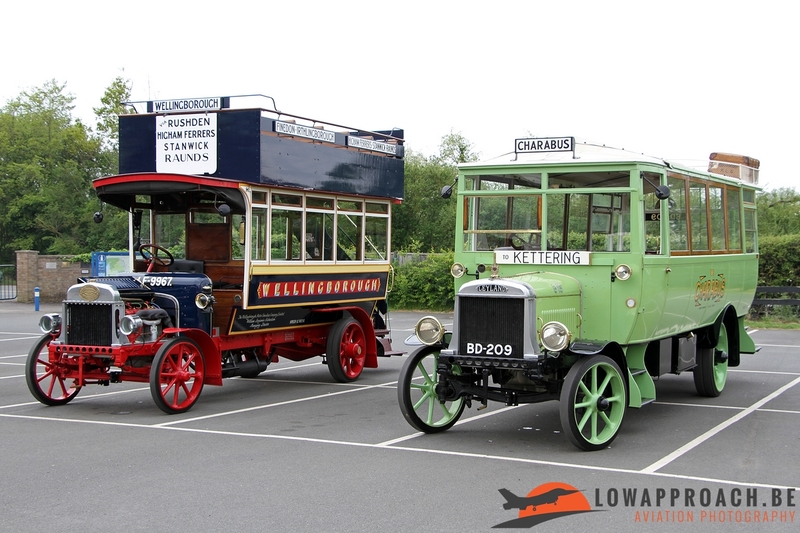 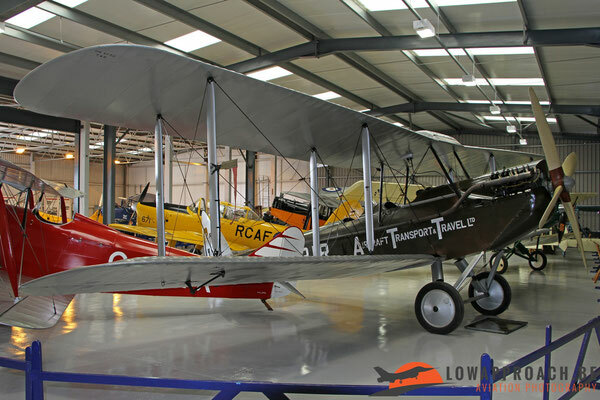 The Shuttleworth Collection was created by Richard Shuttleworth in the beginning of the 20th century. It not only consists of aircraft (1909 – 1950’s period), but also cars, motorcycles and Agricultural exhibits form part of the collection that is housed at Old Warden Aerodrome next to the The House with its Swiss Garden, which dates back to 1875. 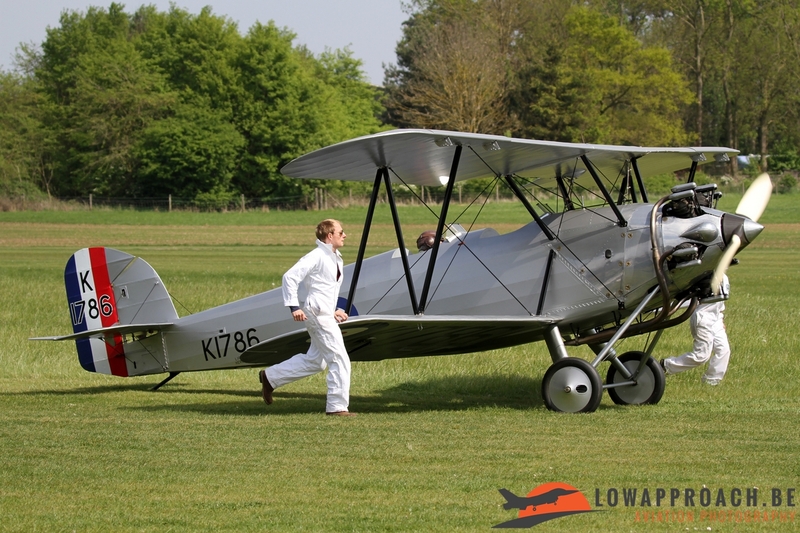 Attending an event at Old Warden is stepping a bit back in time. 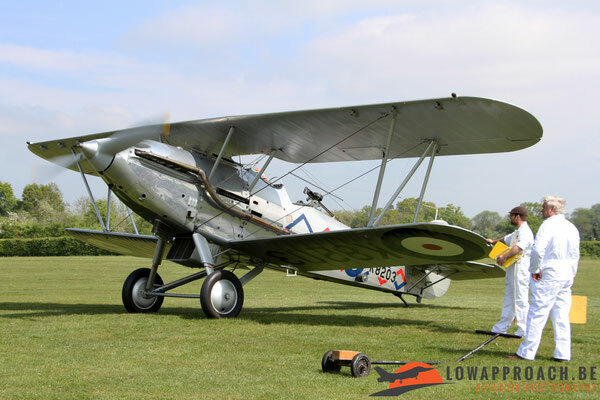 The aerodrome is located in the English countryside near Bedford and you are immediately submersed in the atmosphere of English breakfast, tea and biscuits and the local pub around the corner. Don't expect modern fast jets or demo teams at the event, it's all about history and the preservation of a unique collection which was continued by Richards' mother after he was killed , at the age of 31, in an aircraft crash in August 1940 while serving in the Royal Air Force. 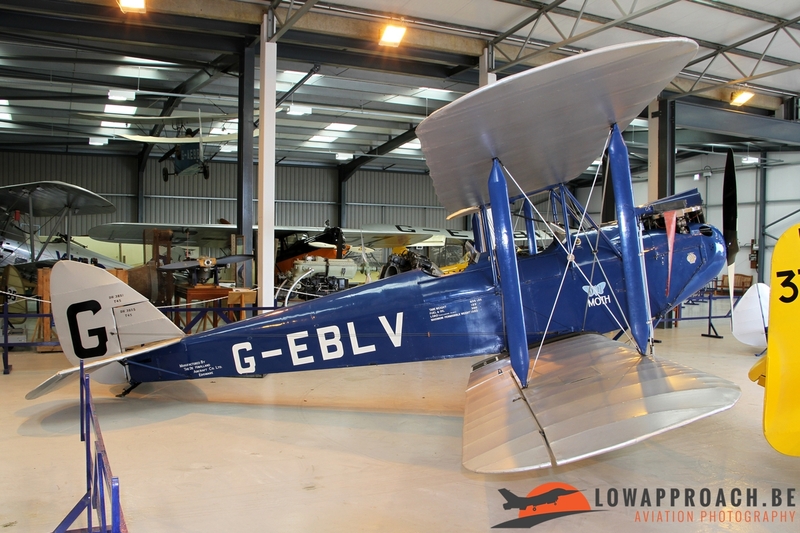 The first aircraft he bought for his collection was a De Havilland DH60X Moth. 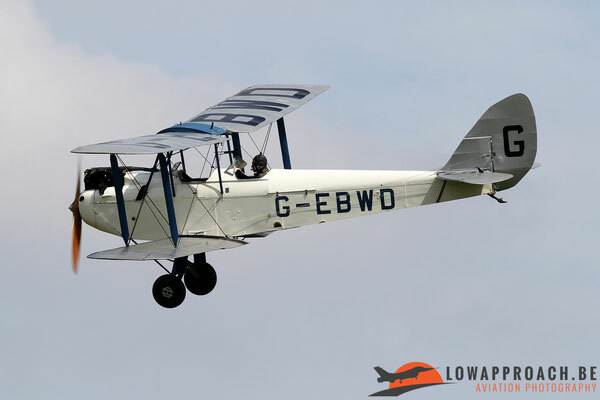 The aircraft was build in 1928, and used by Richard for his flight training at the Brooklands School of Flying, after which he bought G-EBWD in 1932. 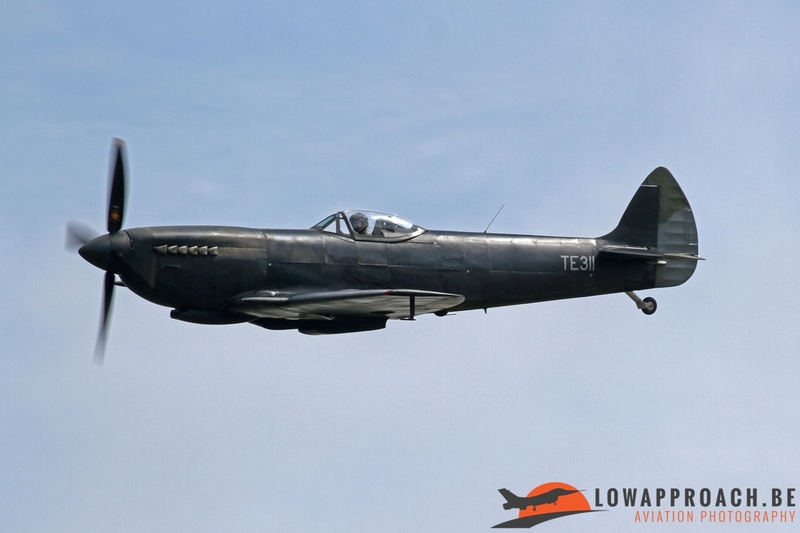 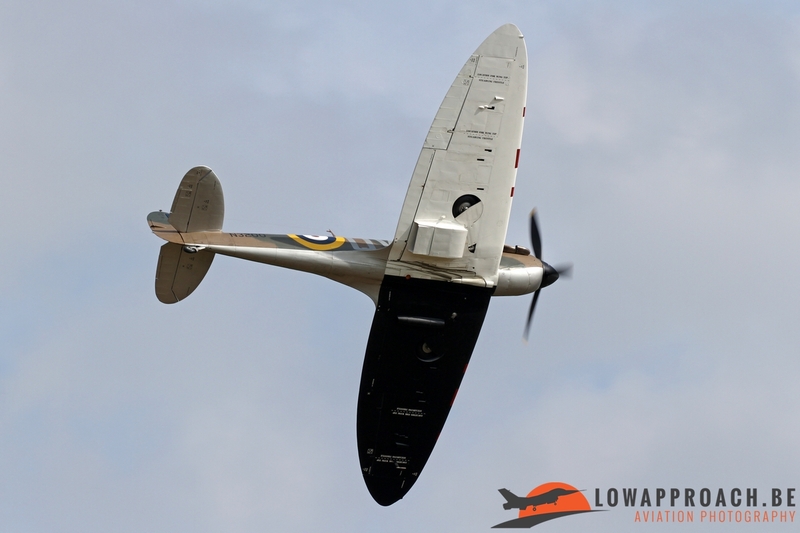 Since then it has remained in the collection and is flown regularly during the flying displays. 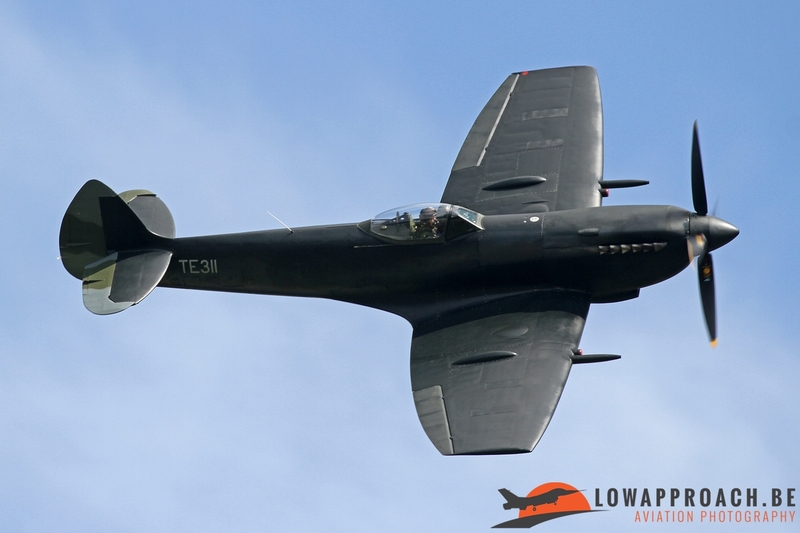 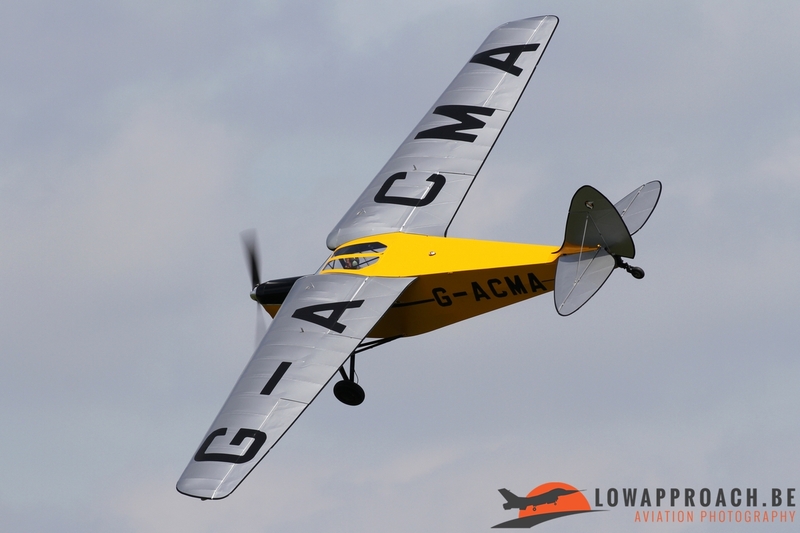 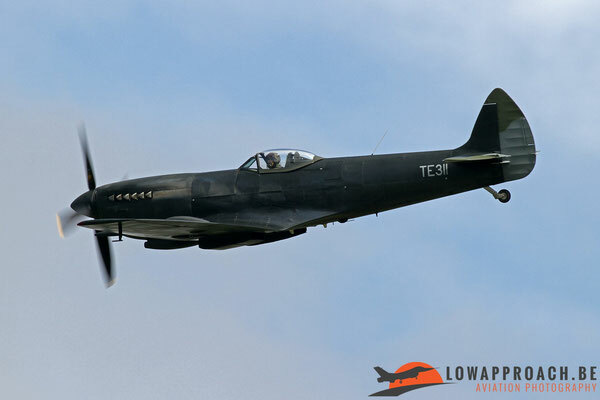 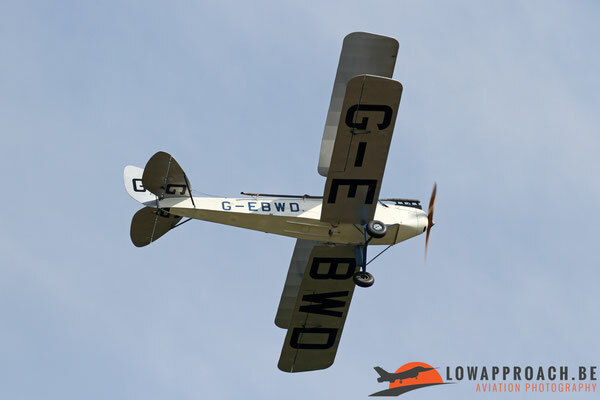 This aircraft holds the record of being based at one aerodrome for longer than any other aeroplane in aviation history. The DH60X is not the only De Havilland aircraft that is in the collection and together with a few visitors the event gave a nice overview of types produced in that era. 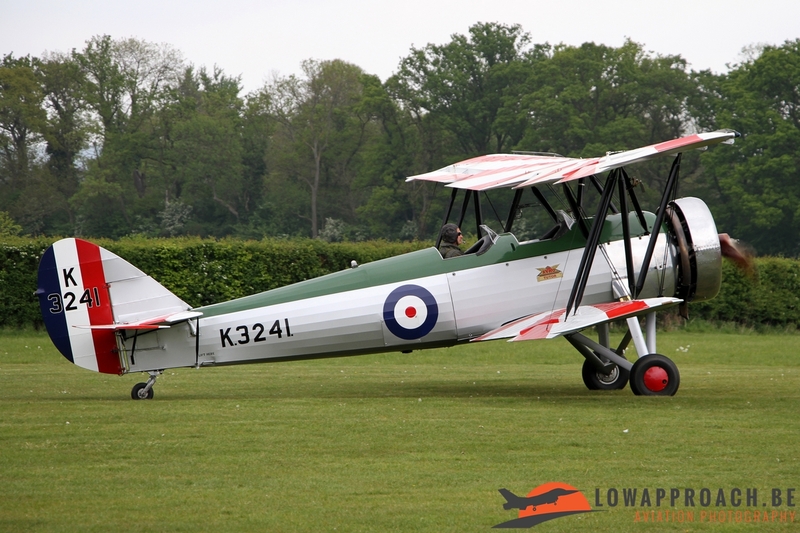 We saw a DH51 Moth, a DH60 Moth, a DH82A Tiger Moth still wearing its WWII era RAF colors, and a DH85 Leopard Moth. One of my personal highlights of the day was the display of the De Havilland DH88 Comet. 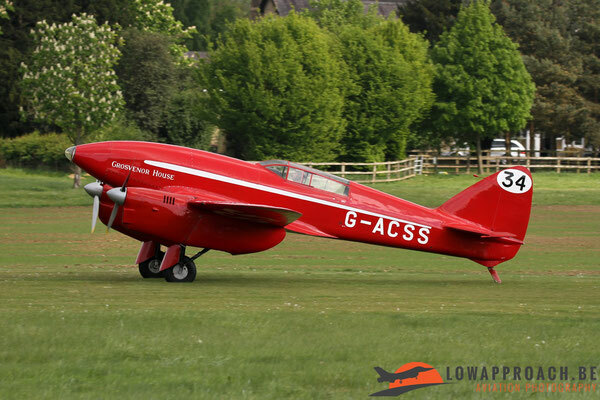 This aircraft was designed specifically to take part in a race from Mildenhall in England to Melbourne in Australia in 1934. 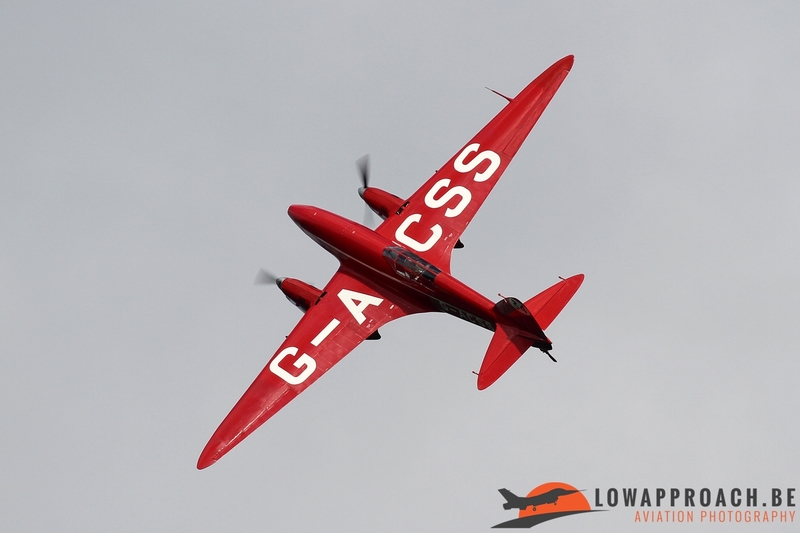 In total three Comets participated in the race, G-ACSS 'Grosvenor House' will flown by C.W.A.Scott and Tom Campbell Black and won the race in the speed category, covering the course in 70 hours and 21 minutes. Final De Havilland product that performed in the display was a De Havilland DH89A Dragon Rapide, which flew in formation with an Avro XIX Series 2, better known as the Avro Anson. 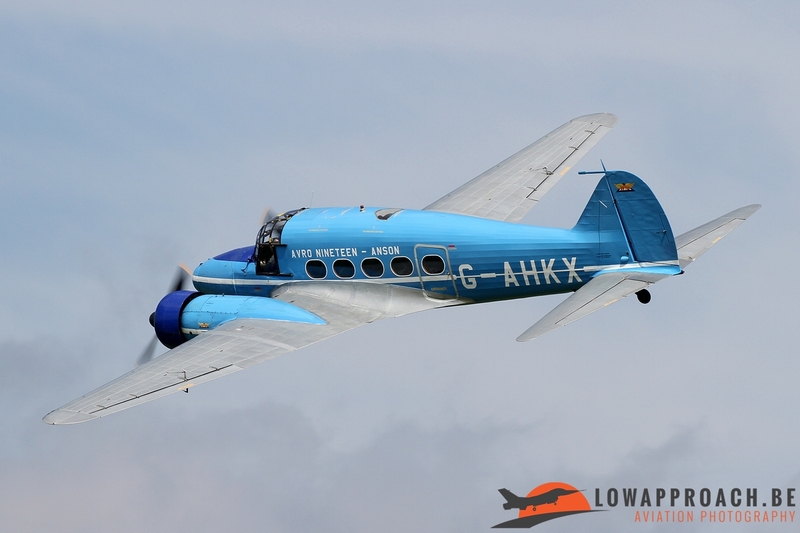 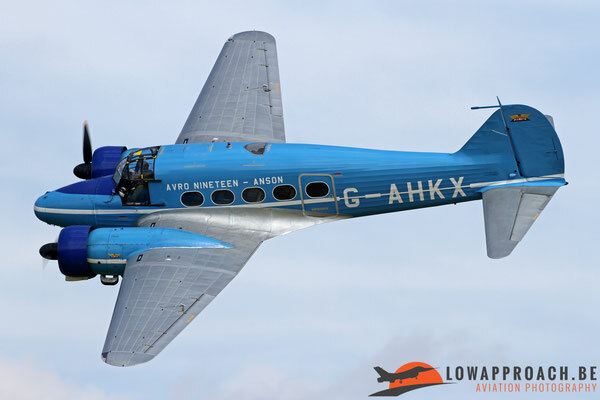 In 2017 the Anson was still in a blue/white civil color scheme, but for the celebrations of 100 Years Royal Air Force in 2018 it will be repainted in a new scheme... which is still a big secret. The Shuttleworth Collection also owns an extensive range of World War I aircraft. Most of them original, but also a number of replicas that were build to the exact specifications as they were in the 1914-1918 period. 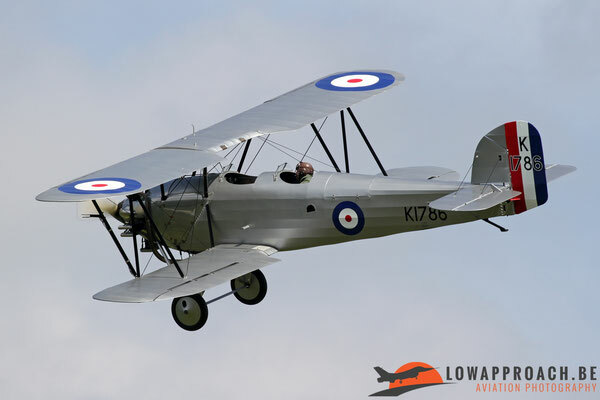 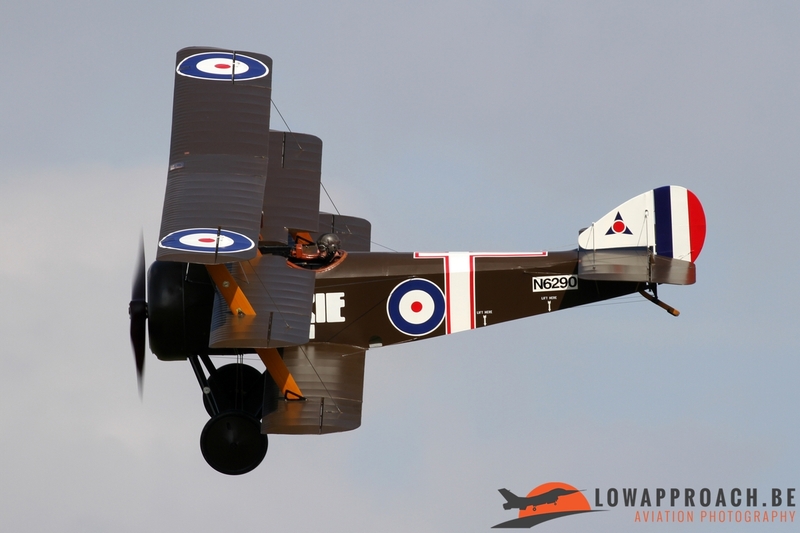 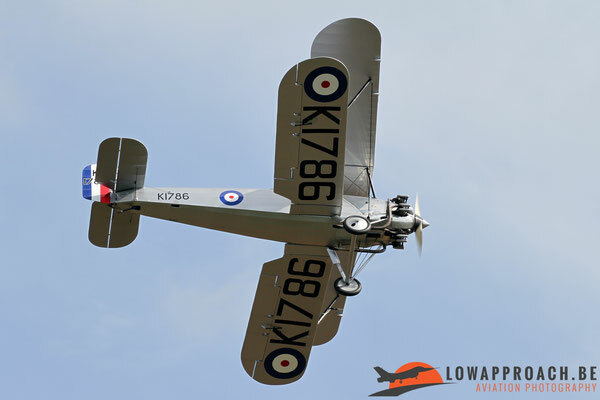 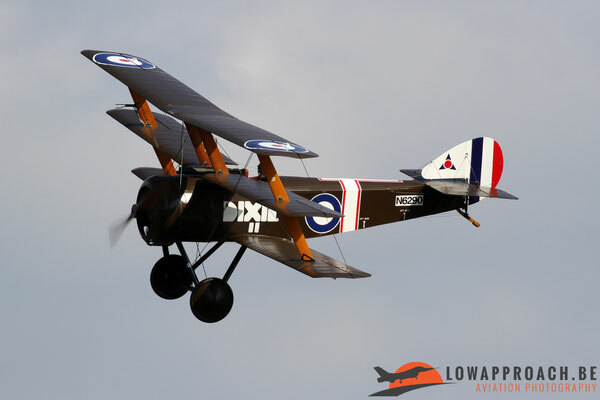 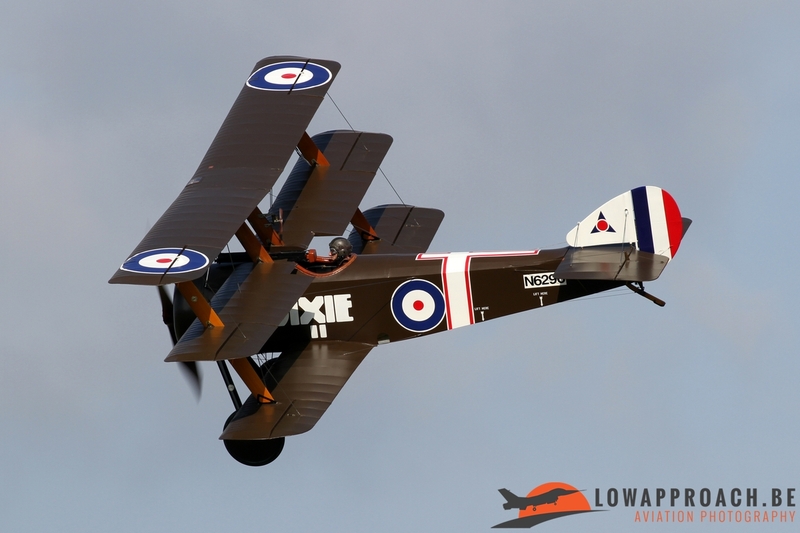 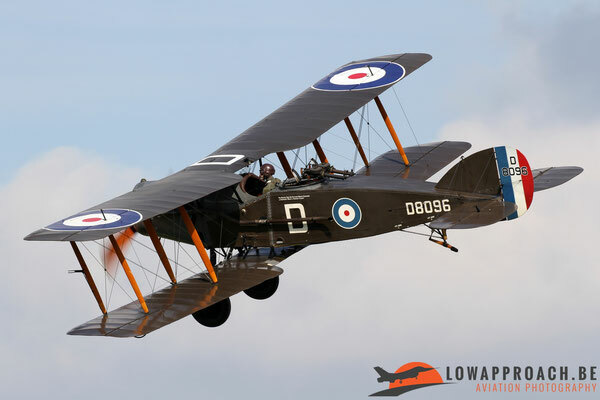 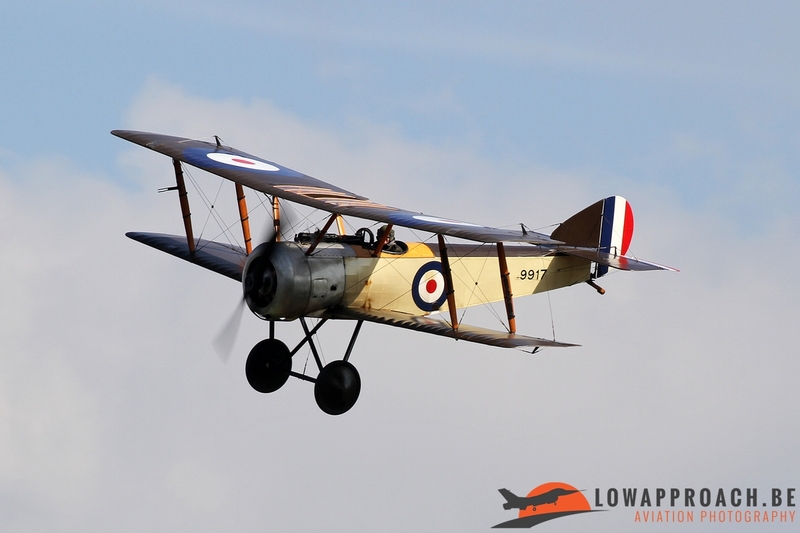 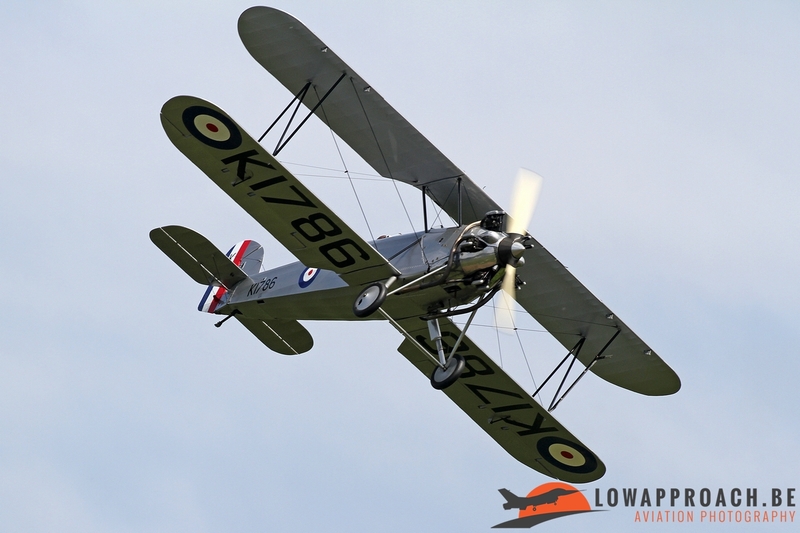 Oldest aircraft of this period are an original Sopwith Pup and a Sopwith Triplane. 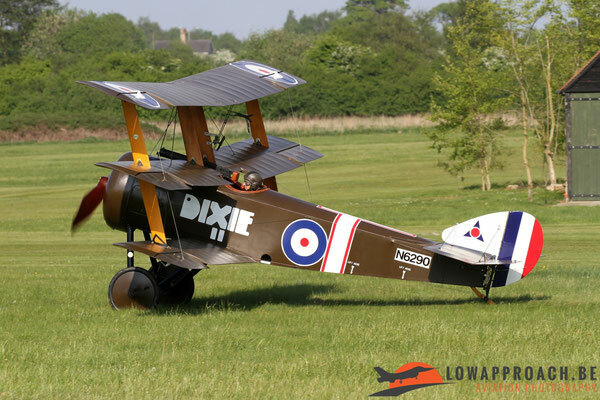 The Pup was in fact originally build as a two-seat Sopwith Dove and modified to the single-seat military Pup configuration by the collection. 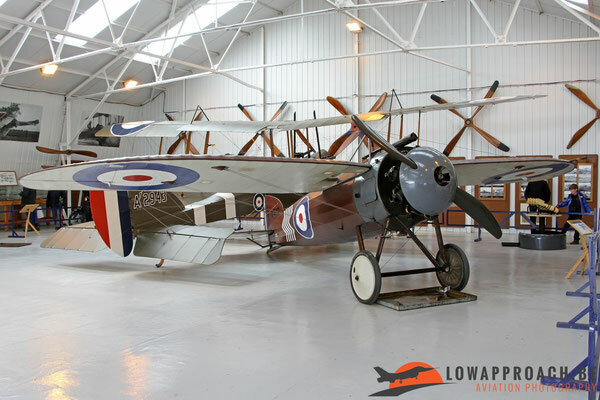 A Sopwith Dove replica, which did not participate in the display, but could be seen in the hangars. 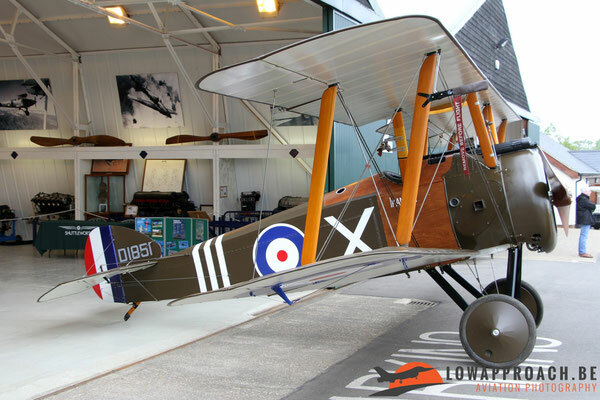 The Dove is on loan to the collection by the builders. 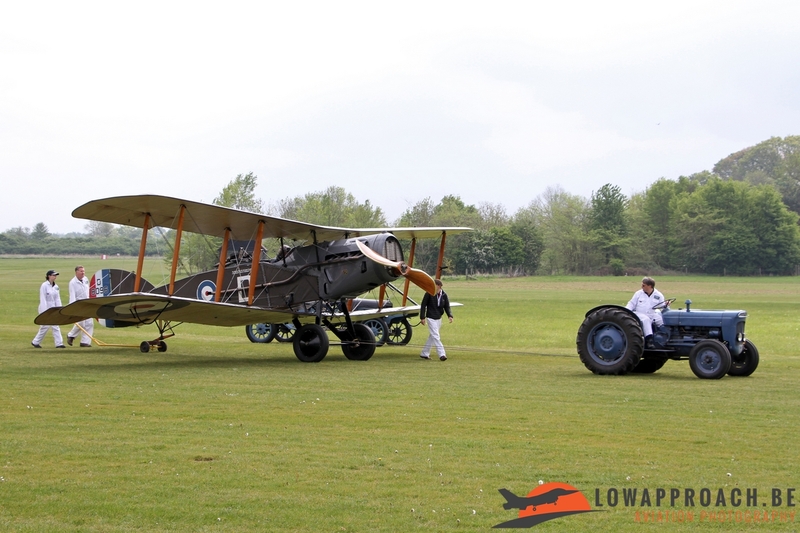 To finish of the Sopwith collection there was also a Sopwith Camel F1 present. 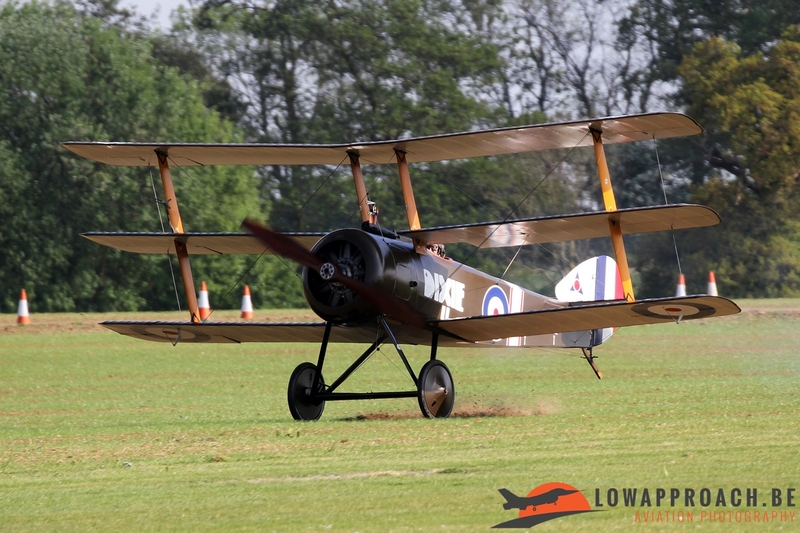 Other World War I era aircraft present at Old Warden were a Royal Aircraft Factory BE2e-1 (replica), a Bristol M1C (replica) and an original Avro 504K. This Avro 504K has an interesting history. 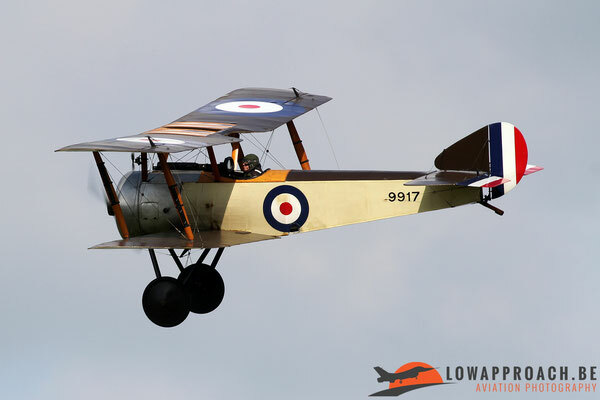 It was build in 1918 and after the war it went into civilian ownership. 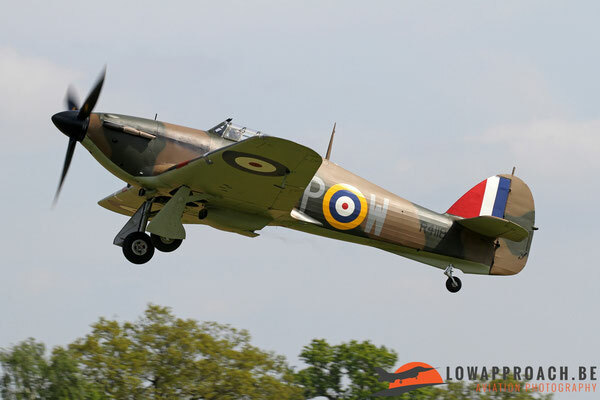 At the outbreak of World War II it was again impressed by the Royal Air Force for military use. 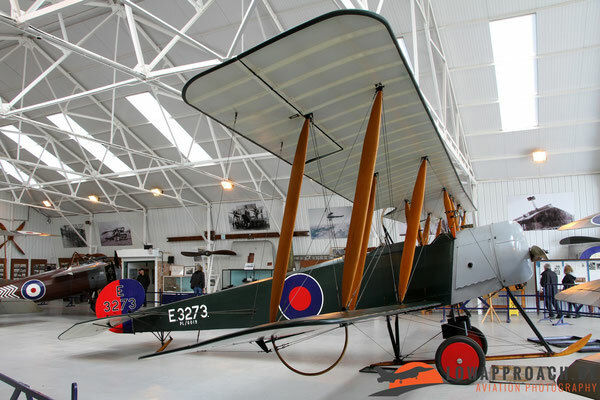 After WWII it again became civilian and converted back to its original military configuration for use in a film, Reach for the Sky, after which it was donated to the Shuttleworth Collection. Largest aircraft from the WWI period at Old Warden is the Bristol F2B Fighter. 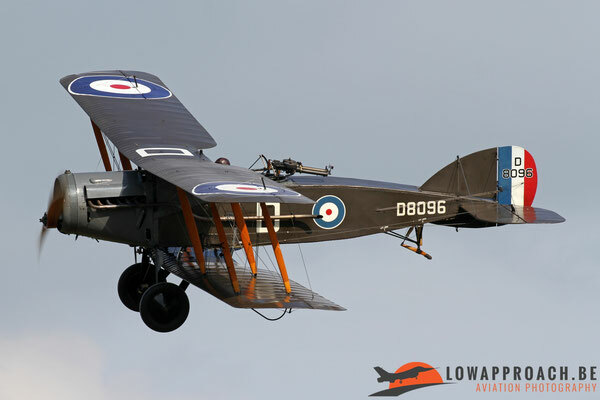 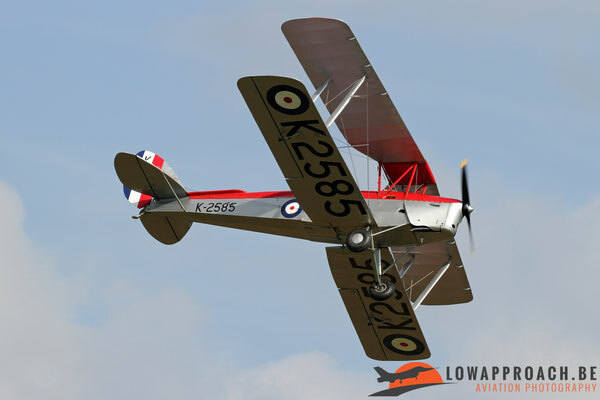 This original 1917 aircraft was acquired in 1936 by someone who intended to restore it to flying condition, but after a series of changes in ownership it took until 1952 to get the aircraft airborne again, after restoration by the Shuttleworth Collection. 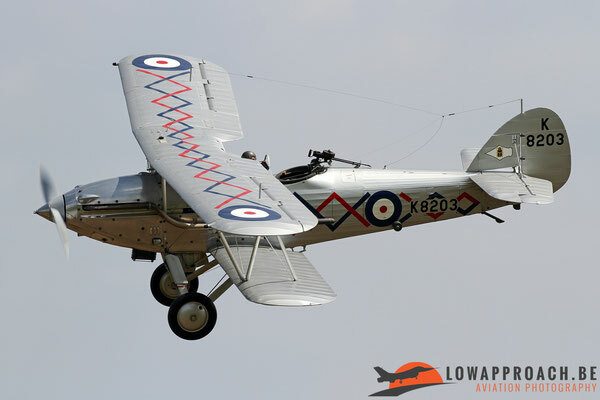 After the First World War the development of military aircraft continued steadily and one of the new aircraft was the Hawker Tomtit designed by Sidney Camm to meet a requirement from the Air Ministry to replace the Avro 504K. 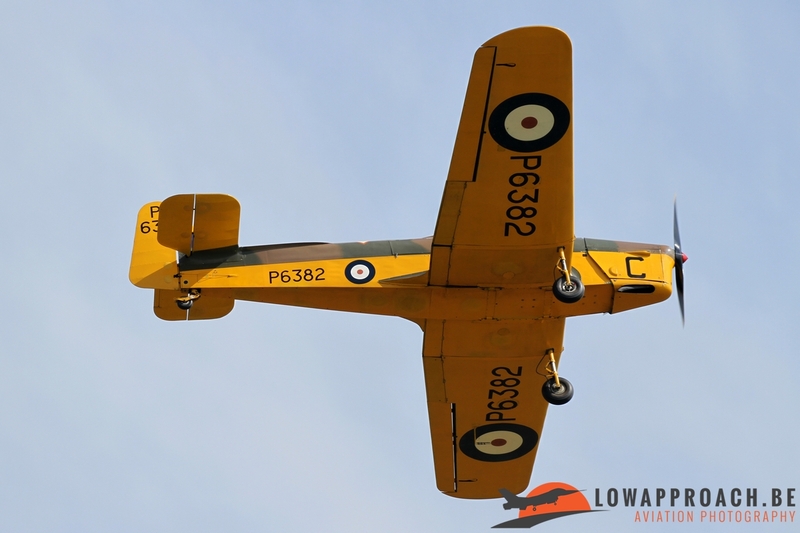 This Tomtit is the only flying example in the world. 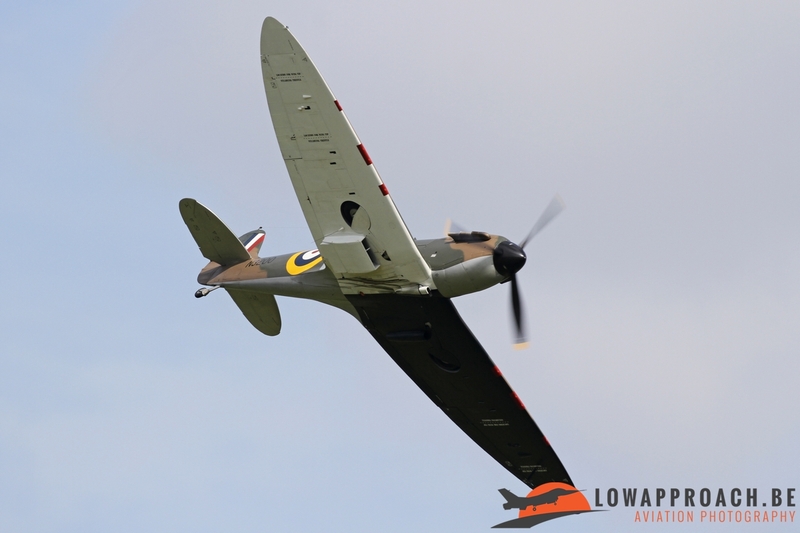 Sidney Camm later became one of Britain’s aircraft designers, working on the Hawker Hurricane, Typhoon, Tempest and Sea Fury. Post-war he participated in the development of the Hawker Hunter and the Harrier. 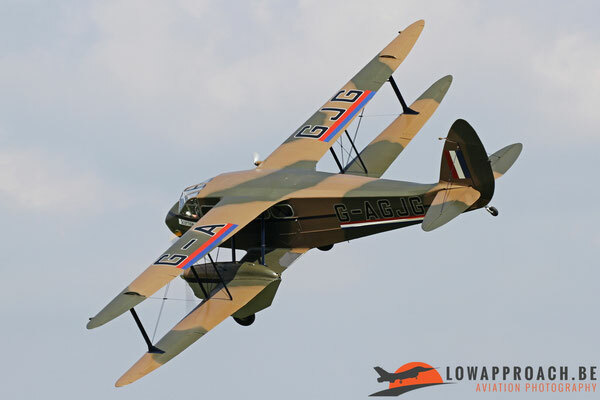 Another of Camm's designs in the 1920’s was the Hawker Hart light bomber. 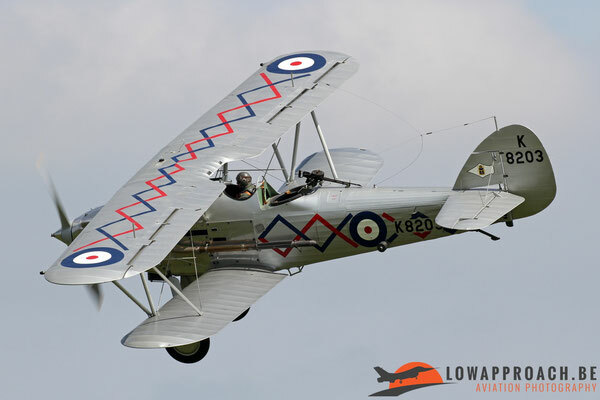 From the Hart the Hawker Demon fighter version was developed that made its first flight in 1933. 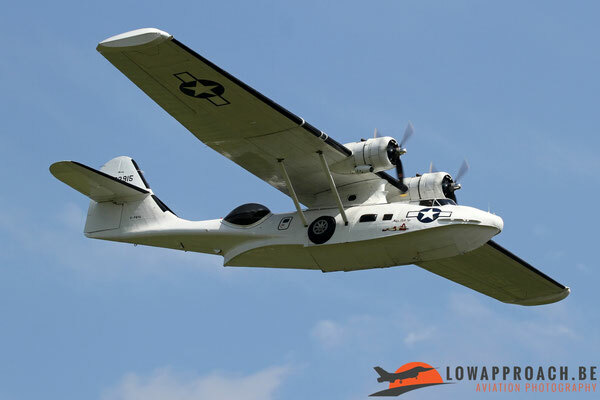 It was used well into the Second World War on second-line duties. 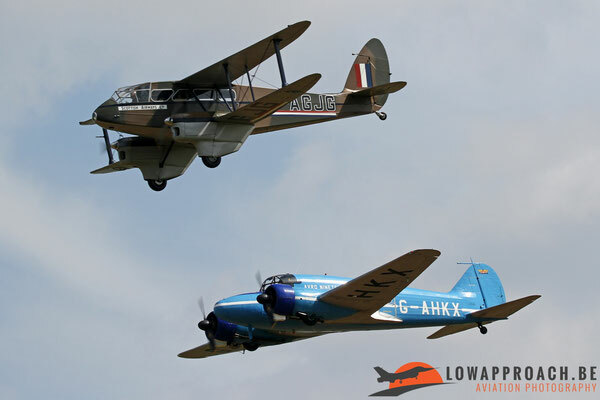 Final aircraft in this row is the Avro 621 Tutor, another aircraft designed to replace the Avro 504K within the Royal Air Force. 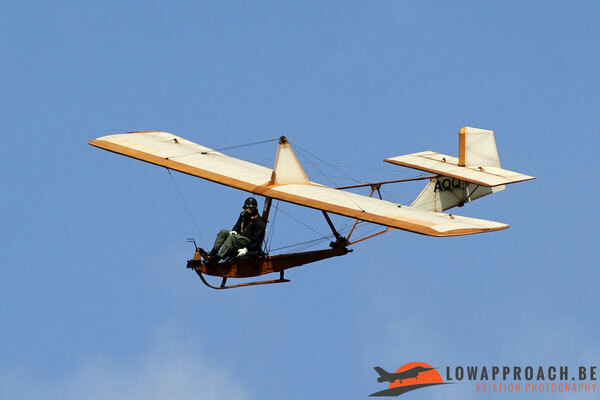 Not only motorized aircraft participated in this year Season Premier Flying Display. 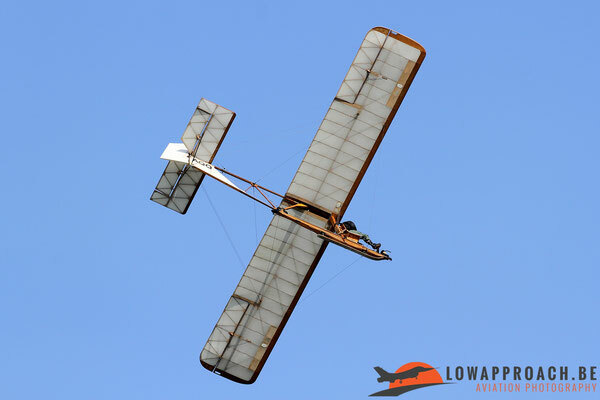 Also a couple of gliders were present. First we saw the Schneider EoN Primary, an English version of the Schneider SG38 that was used after WWI by the Luftwaffe to train its pilots. 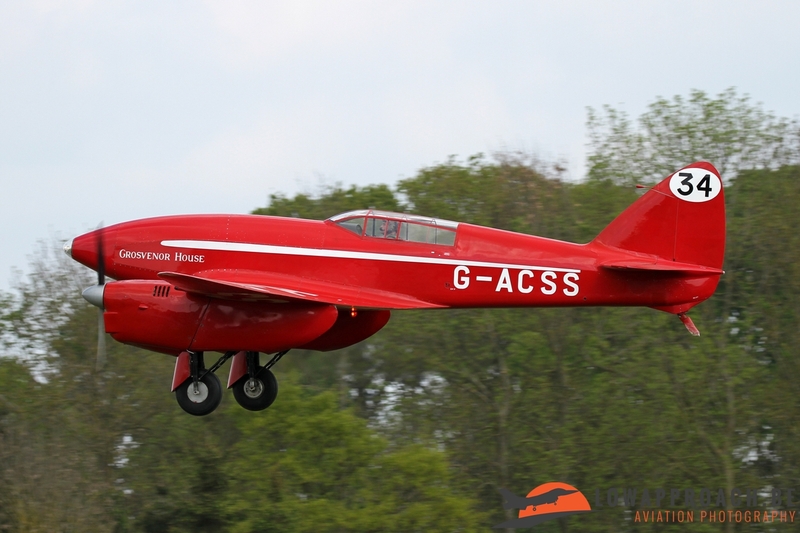 Elliot of Newbury (EoN), a furniture manufacturer, turned to glider production in 1945, and produced the Primary, an improved version of the SG38 'Schulgleiter'. 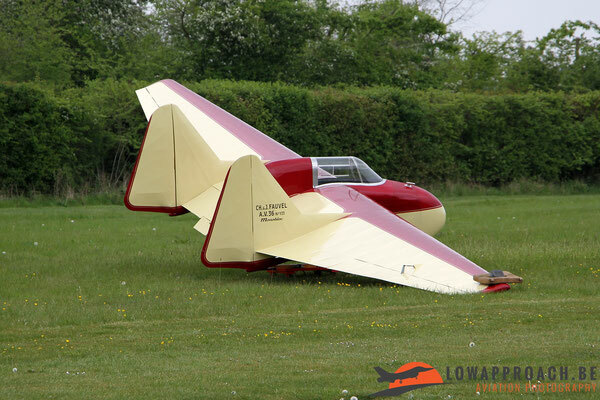 The Fauvel AV36C was developed by Charles Fauvel, a French designer, who in 1928 conceived his idea of a flying wing. Over the years Fauvel designed several versions and the AV36 came of the drawing board in 1951. 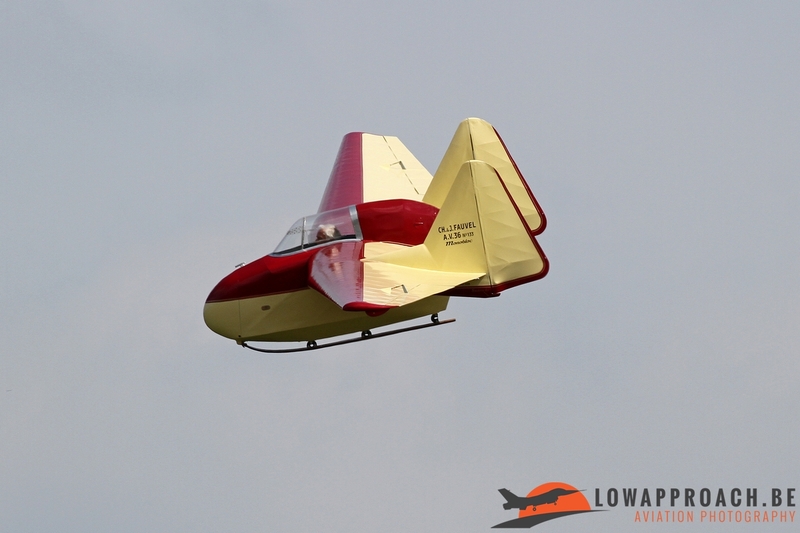 Around 50 were built as kits and another 100 were build by amateur builders. 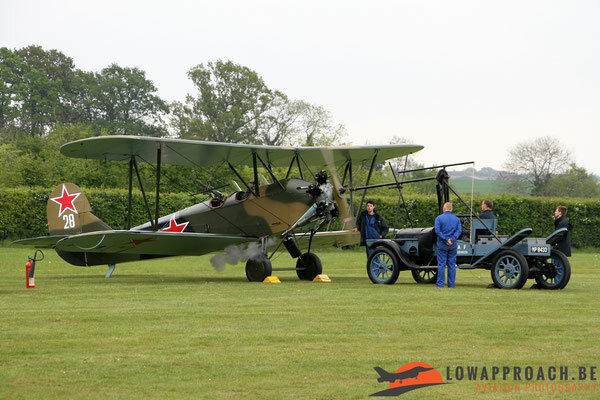 World War II aircraft are also present at Old Warden, although you would not immediately expect a Russian aircraft amidst this collection of British types. The Polikarpov Po2 started life as a crop duster in 1927 as the 'U2'. 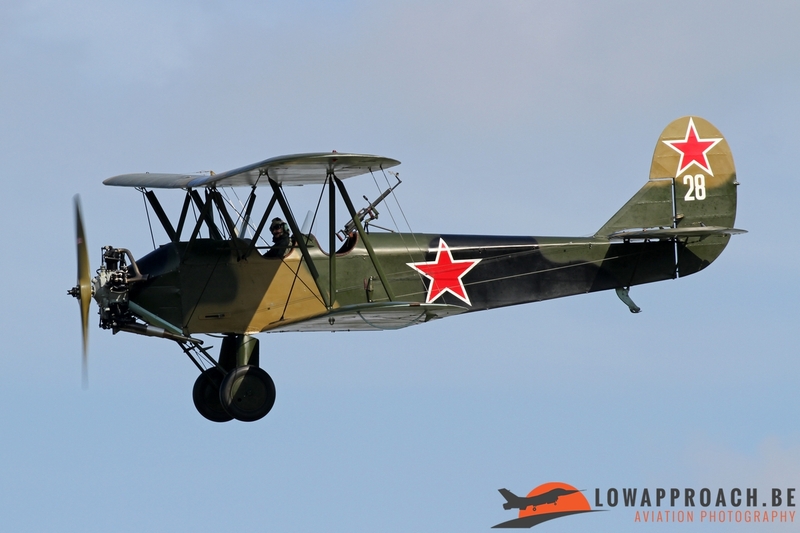 Over the years many military and civil variants were designed and build. 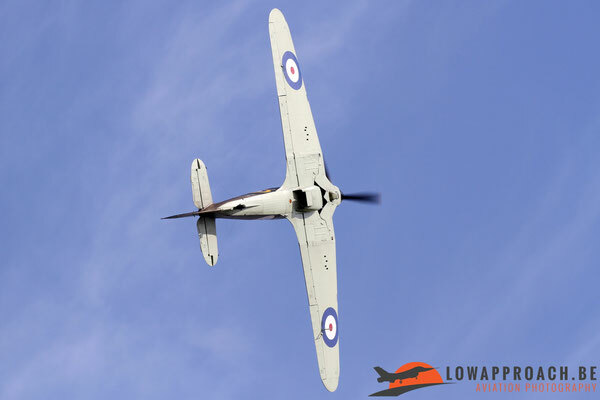 During the war it was used on night bombing raids, flown by female pilots, and as a light attack and close support aircraft. 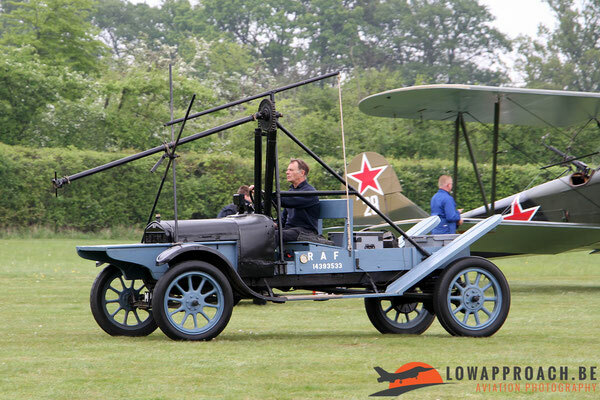 Prior to its display at Old Warden it was started the 'classic way' by using a 1920 Hucks Aircraft Engine Starter. 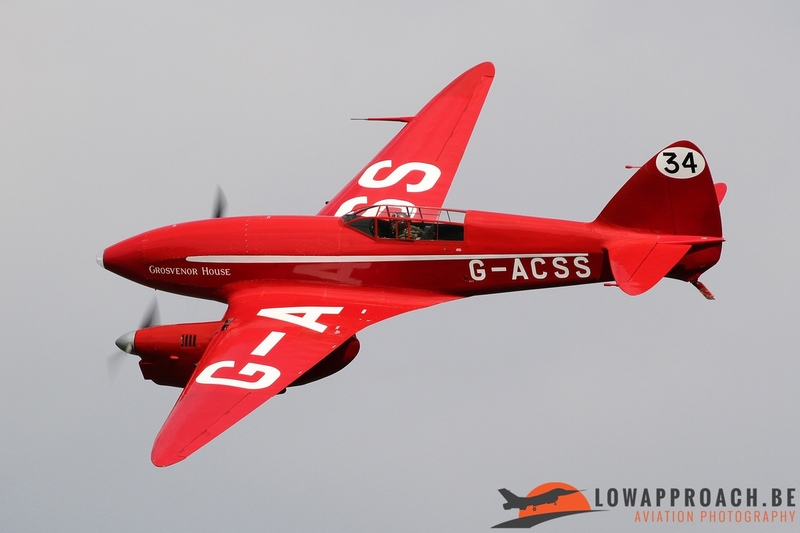 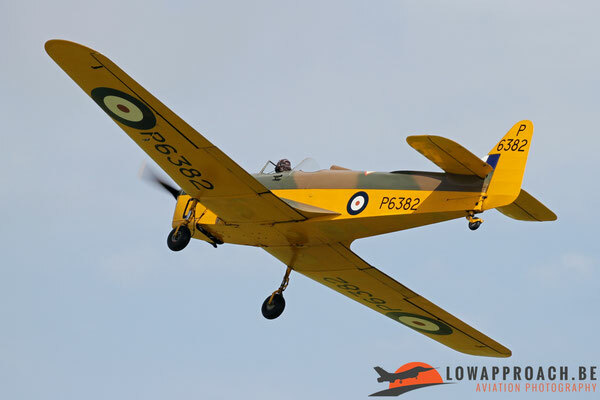 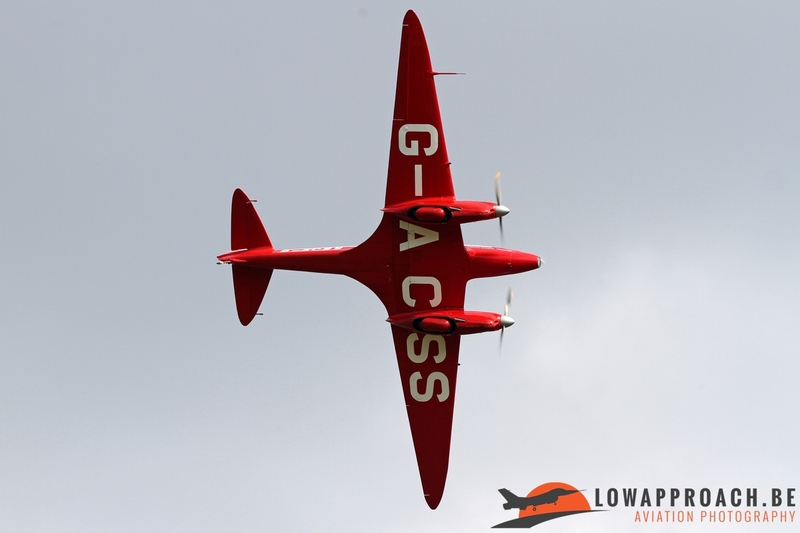 The second aircraft in this part is a Miles Magister I, or the 'Maggie', first flown in 1937 and used by the Royal Air Force and Royal Navy in the training role. No flying display in the United Kingdom is complete without a Spitfire. 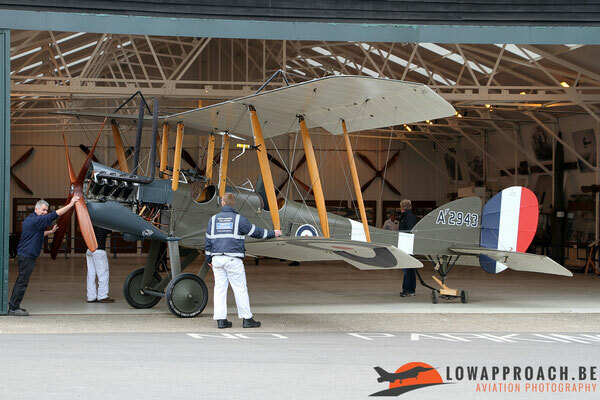 As the Shuttleworth Collections own example is still undergoing a major overhaul, two visiting aircraft had to take honors. 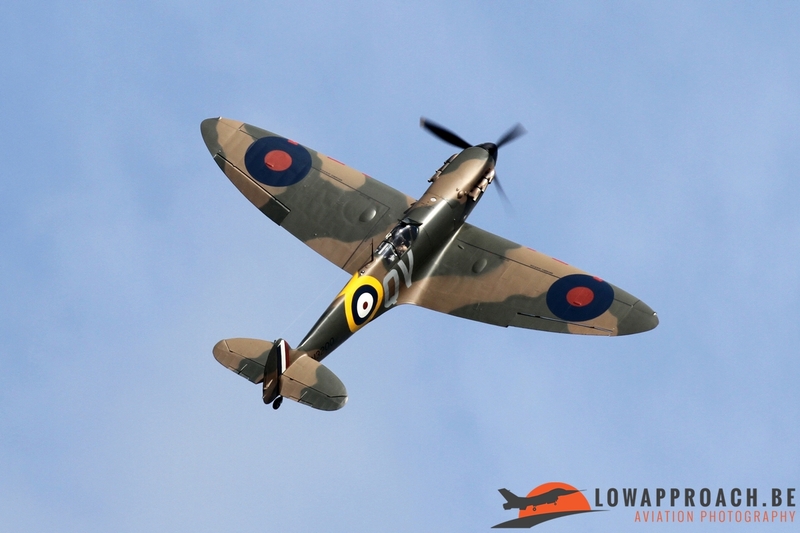 The first one was an early Spitfire Mk.Ia, which was the first operational variant of this famous fighter. This particular aircraft, now based at Duxford, was in service with the Royal Air Force and formed part of No 19 Squadron, deployed to France in May 1940. 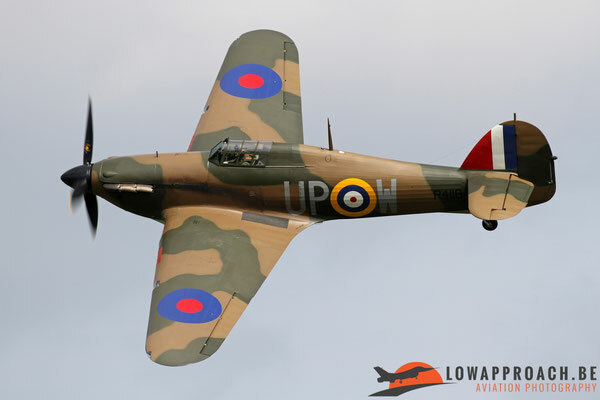 On May 26th it was shot down during combat with German fighters and the pilot landed the damaged aircraft on the beach of Sangatte, near Dunkirk. Slowly the aircraft was buried in the sand until it was recovered in 1986 and put on display in a French museum. 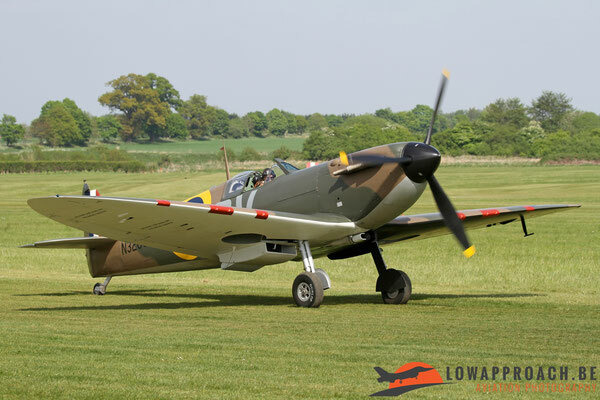 In 2000 the remains were bought by a British owner and in 2007 the restoration started at Duxford, resulting in a first flight in March 2014. 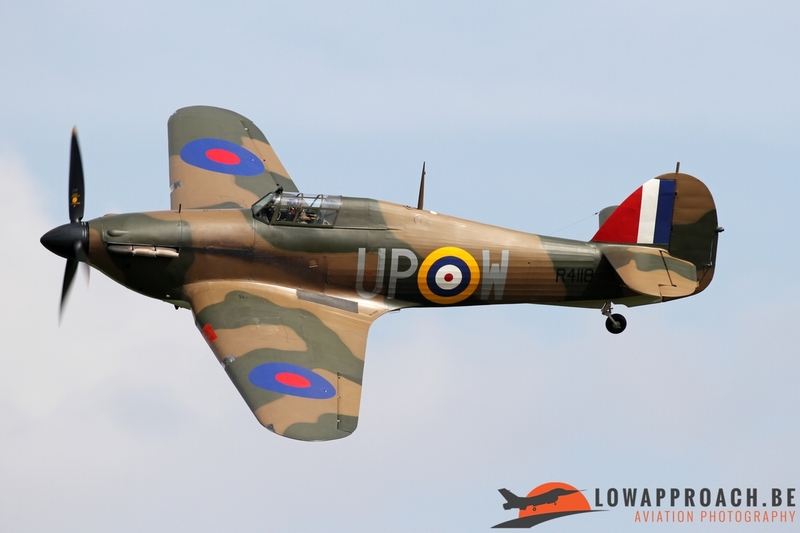 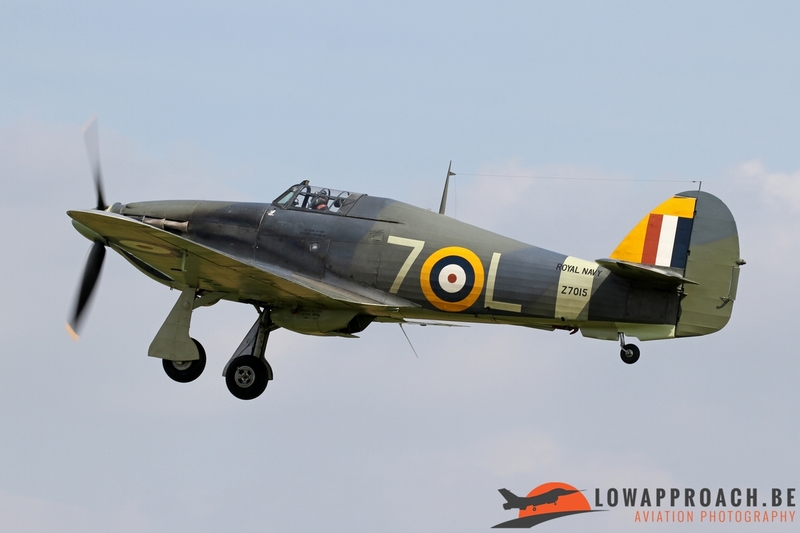 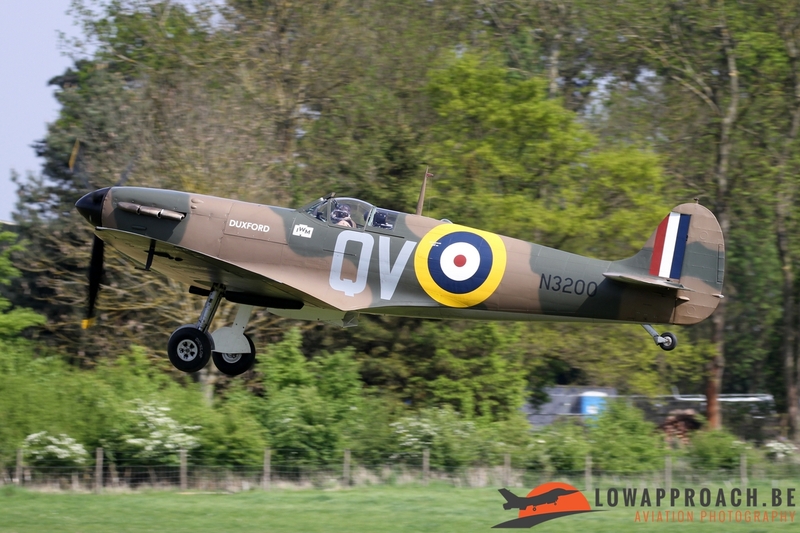 The aircraft is again wearing the exact color scheme it wore when in service with RAF No 19 Squadron in 1940. 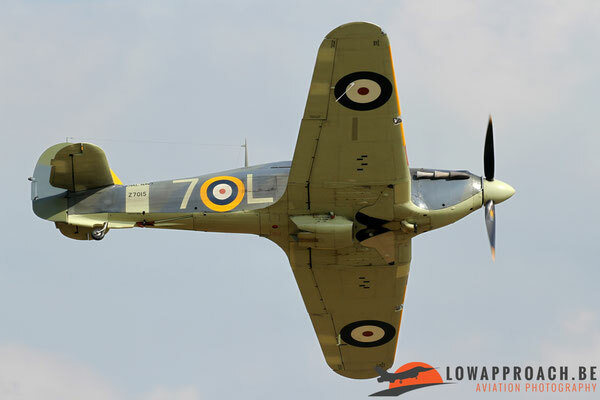 The second example of the Spitfire, a much later Mk.XIV variant, is still in service with the Royal Air Force's Battle of Britain Memorial Flight. During the 2017 summer the aircraft was flown in a black primer scheme, probably to get a new 'operational' color scheme just in time for the RAF 100th Anniversary celebrations in 2018. The Battle of Britain in 1942 is one of the best known aerial campaigns of the Second World War. 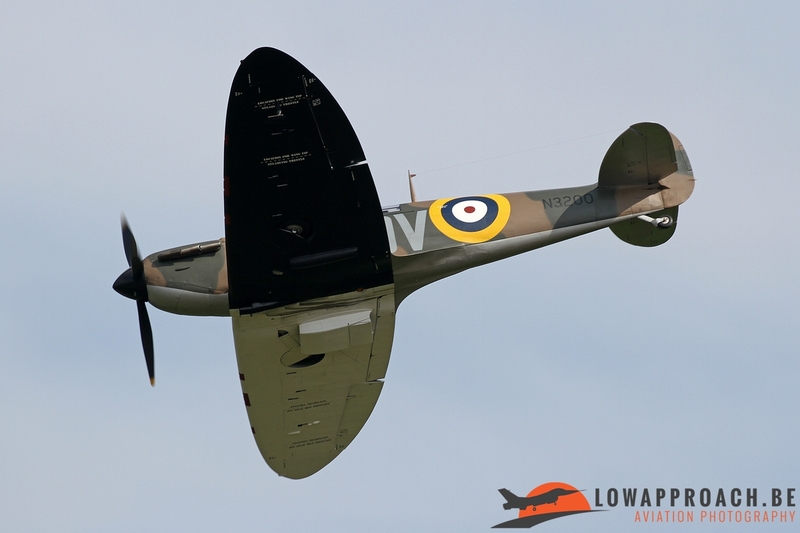 In July 1940 the German launched an aerial campaign in order to weaken, or completely destroy, the Royal Air Force, hoping to force Britain into a peaceful ceasefire. Over a period of almost four months the smaller Royal Air Force withstood the virtual daily attacks from the Luftwaffe on the British mainland. 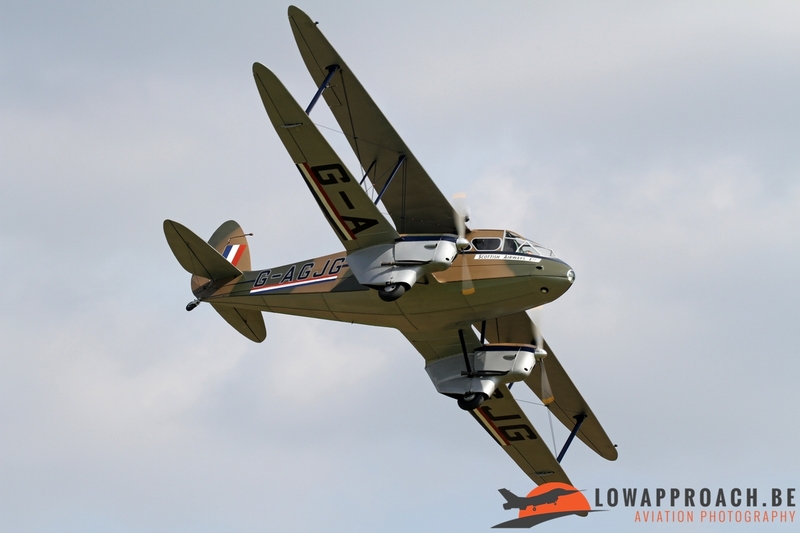 On September 31st, 1940 the German aerial campaign stopped. 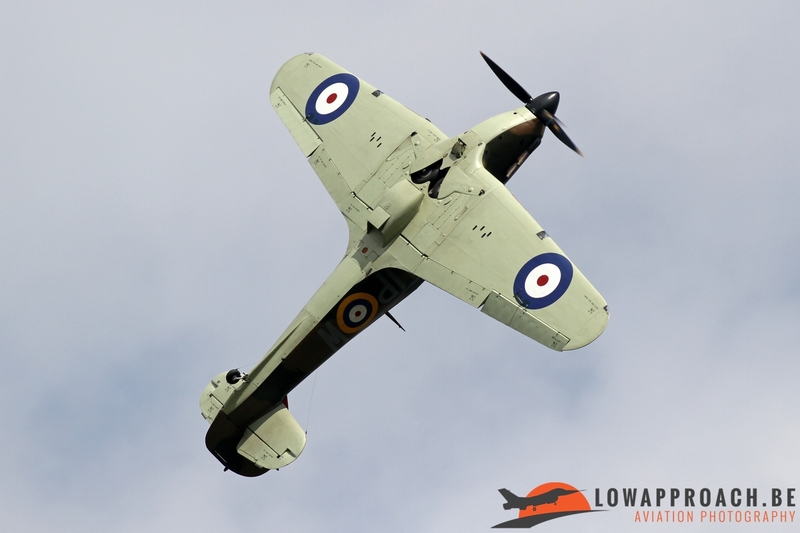 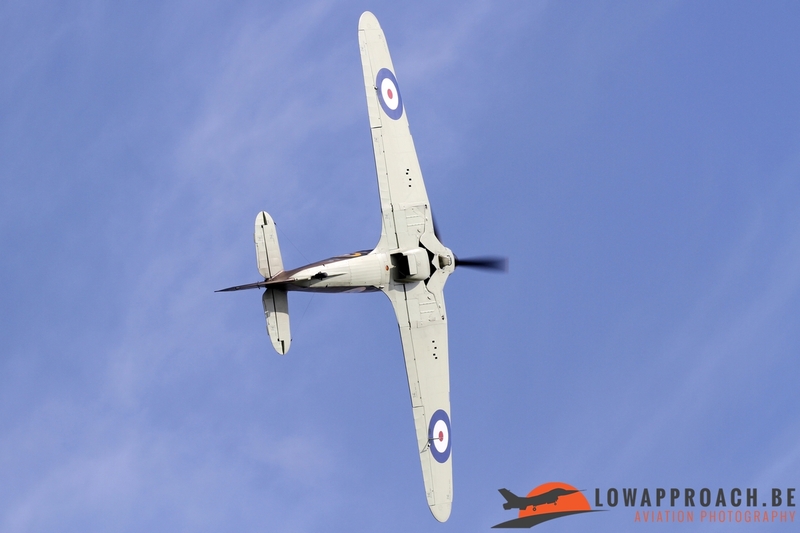 For many 'the' fighter in the Battle of Britain was the Spitfire (mainly influenced by the 1960s movie 'The Battle of Britain'), but the fighter which was used the most was in fact the Hawker Hurricane. 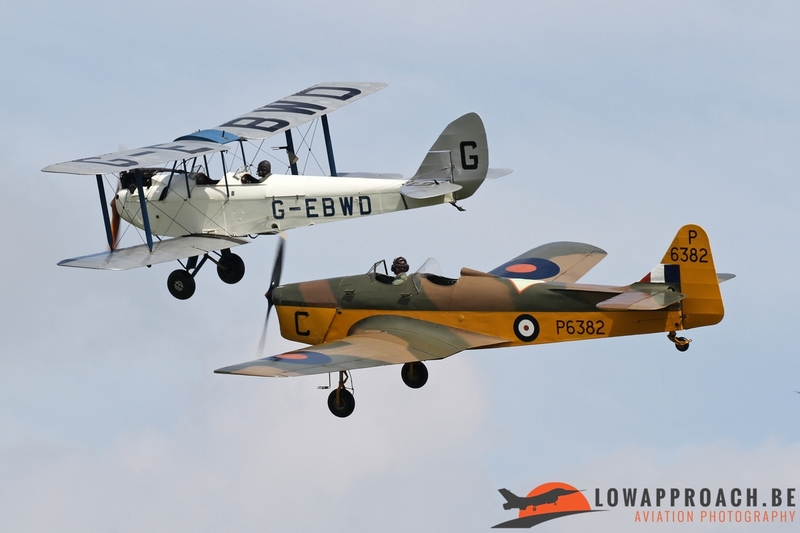 During the aerial display two examples were present. 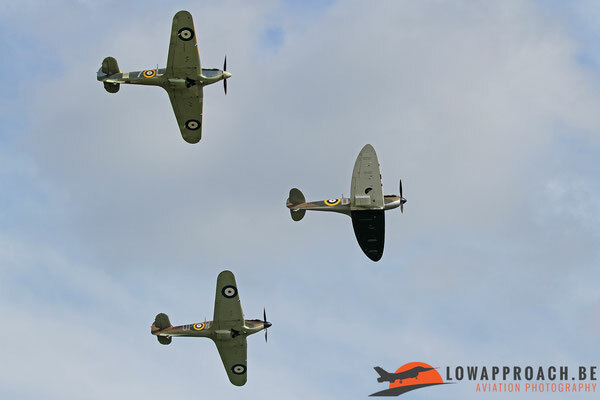 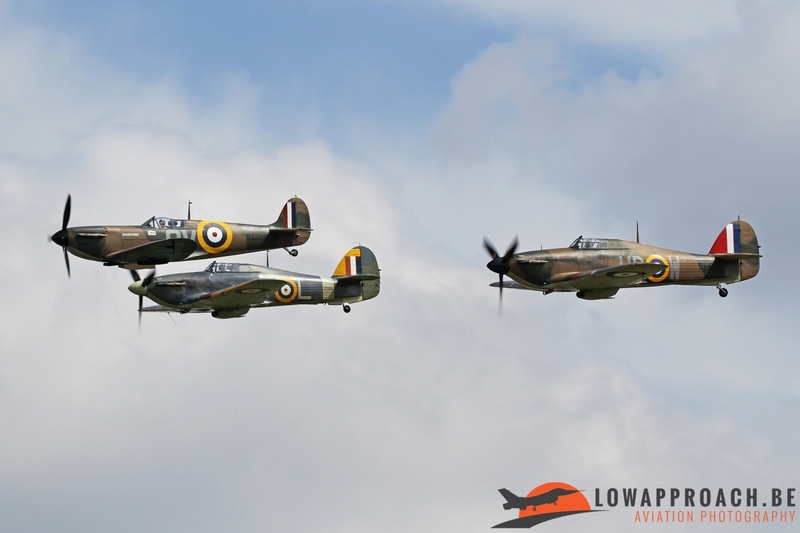 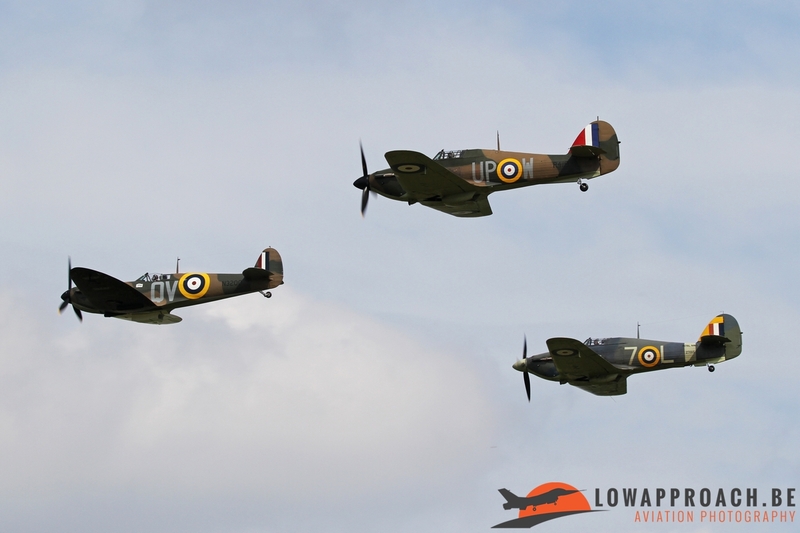 Both aircraft started their display in a formation led by the Spitfire Mk.I, but they quickly broke up the formation and started their individual routines. 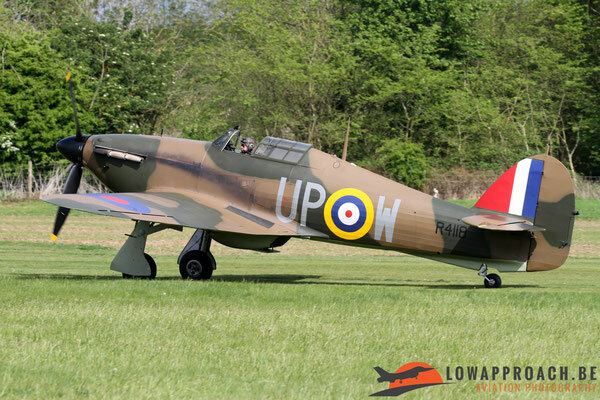 The first Hurricane is an early Hawker Hurricane Mk.I with again a remarkable history. After its operational use from 1940 until 1943 with the Royal Air Force, in which it was rebuilt no less than three times after various incidents and crashes, it was send to India for use as a training aircraft. 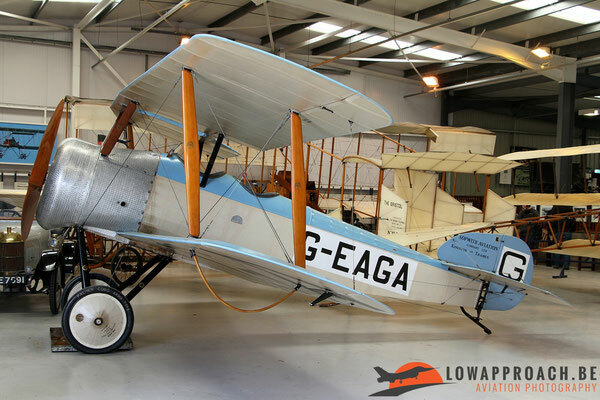 However it was never needed and remained in its packing case until 1947 when it went to a university to be used as an instructional airframe. 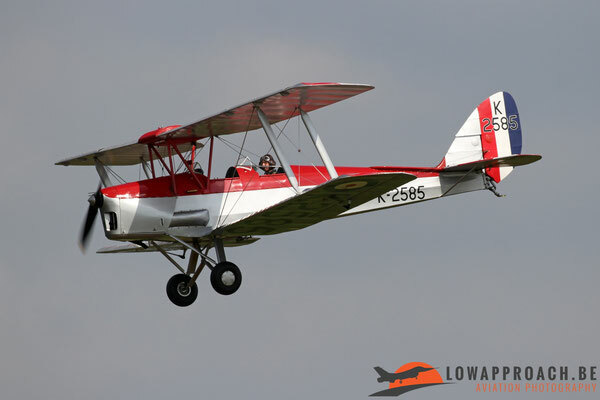 In 1996 a retired businessman started negotiations to bring R4118 back home. In 2001 the remains were finally crated again and brought to the UK were a restoration to flying condition began . 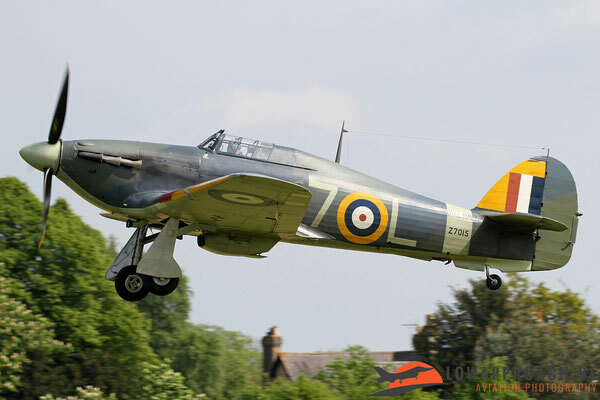 On December 23rd, 2004 R4118 made its first post-restoration test flight. 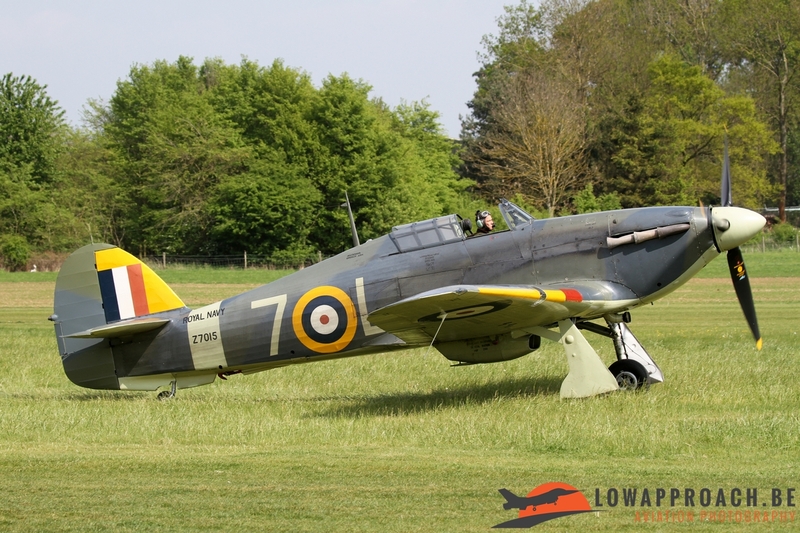 In 2015 the owner sold the aircraft to a new organization, Hurricane Heritage, which have now have based the aircraft at Old Warden. 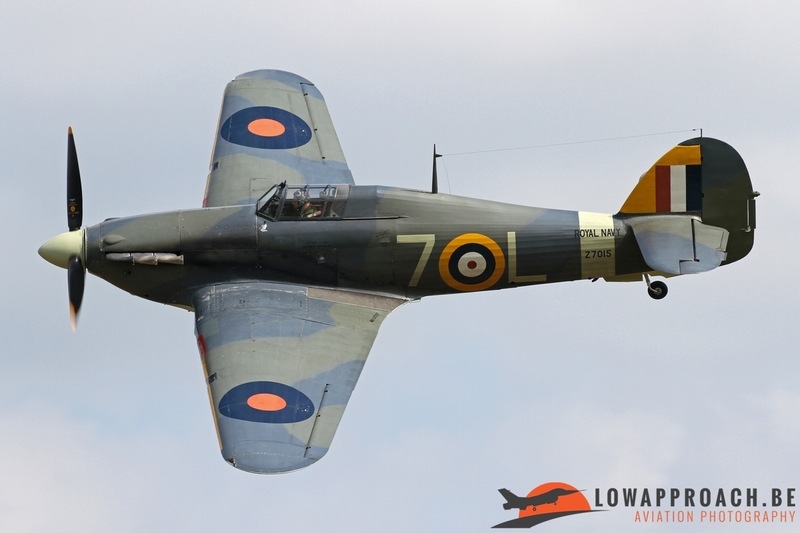 The second Hurricane in the display is the Shuttleworth Collection’s own example, a rare Sea Hurricane 1b. 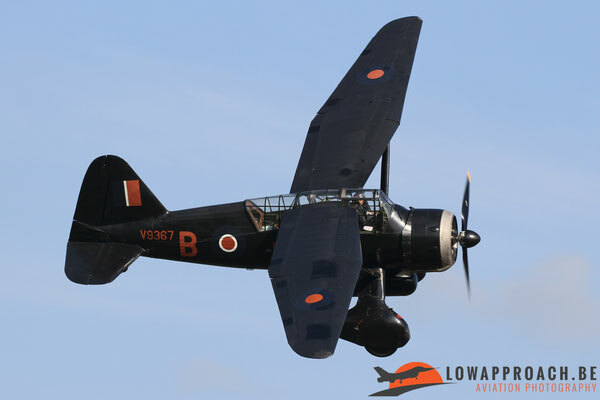 This aircraft is the only airworthy example of the naval variant at this moment. It was build in Canada as a standard Hurricane and shipped to the UK, where upon arrival it was modified into a Sea Hurricane. The modifications included strengthening of the structure so that it could withstand the heavy catapult and arrester loads during carrier operations. 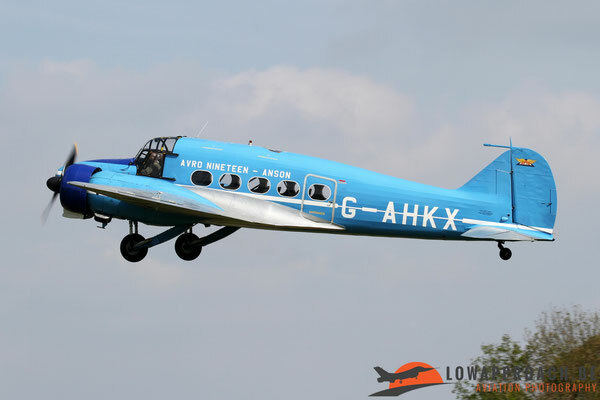 The aircraft was acquired by the collection in 1961 and it took them until 1995, after several aborted attempts, to get the aircraft back into the air. 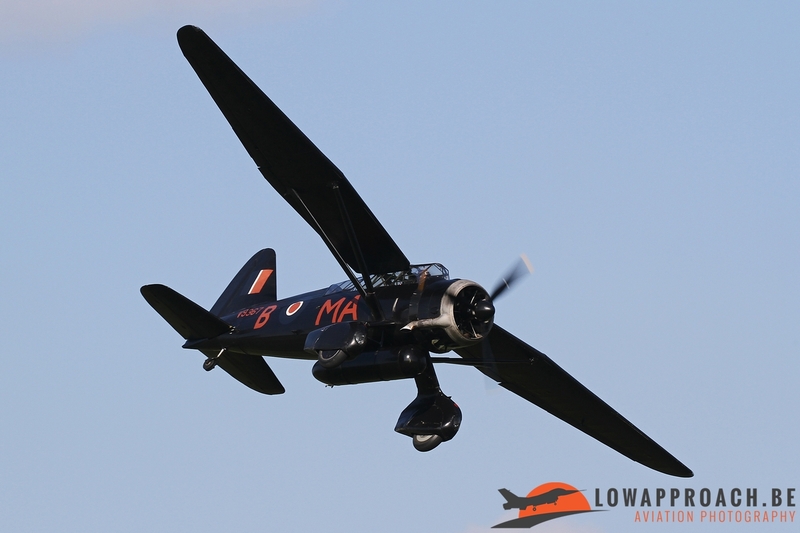 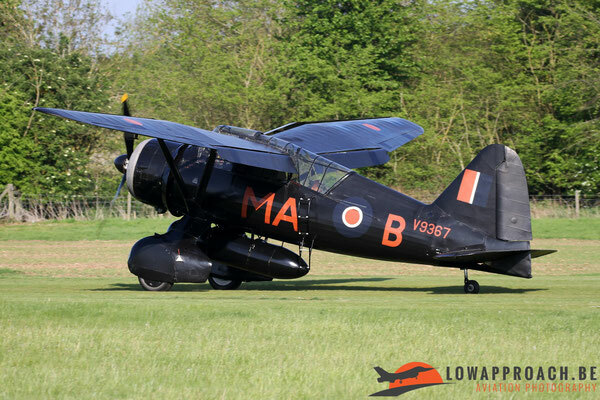 Another rare World War II period aircraft owned by the Shuttleworth Collection is the Westland Lysander III. 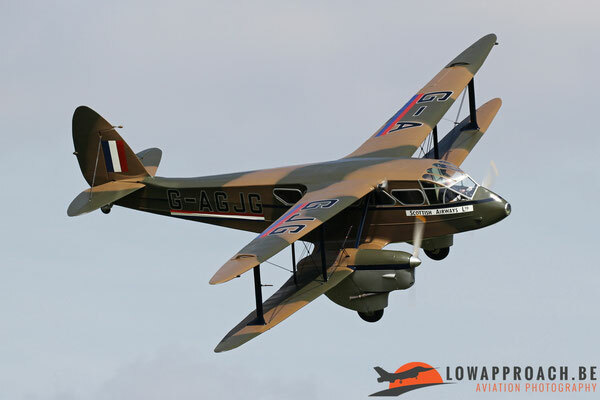 The 'Lizzie' entered service with the Royal Air Force in 1938 as an army observation and reconnaissance aircraft. 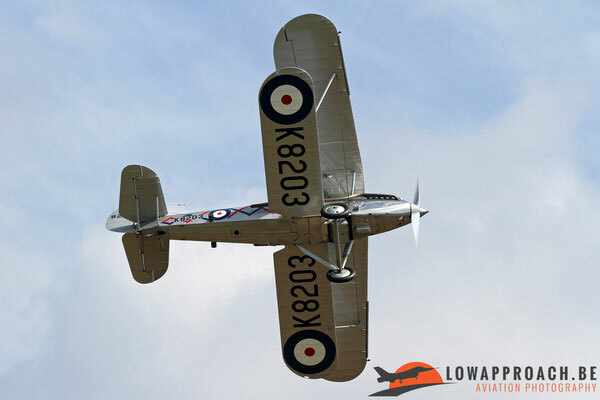 The aircrafts flight characteristics of short landing and take-off, and the possibility to operate from unprepared landing grounds, made it ideal for covert operations during the war. 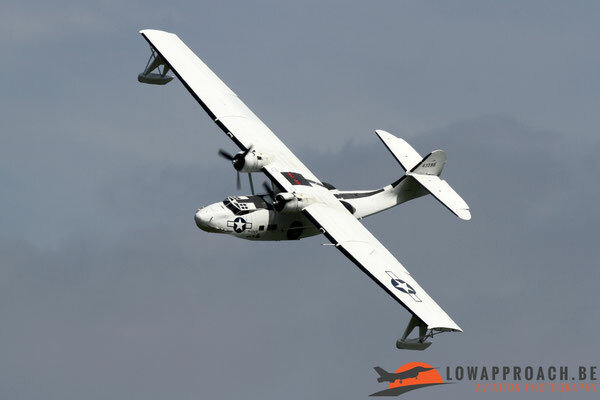 In addition to the pilot it could carry two passengers, and under its wings it could carry weapons and stores. 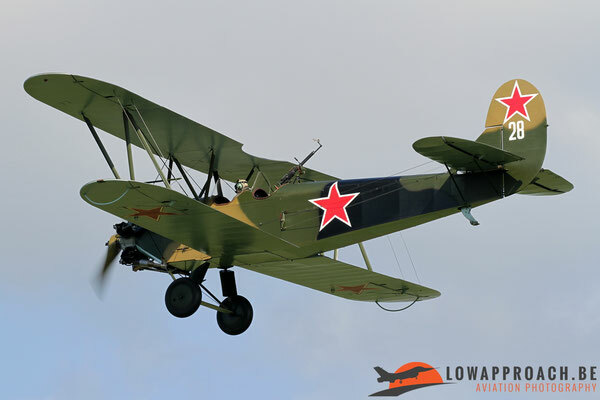 As such it saw intensive use in the delivery of agents behind enemy lines. 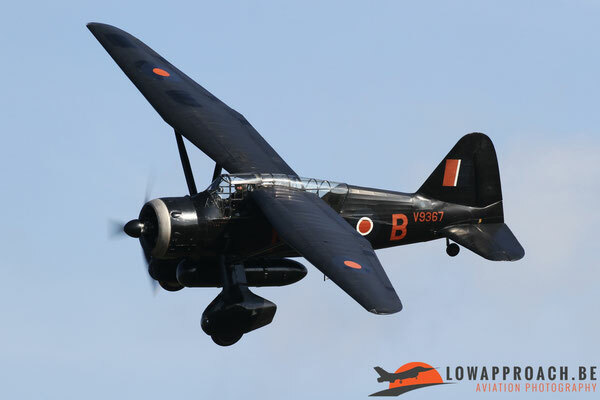 The black color scheme is still a reminder to this role. 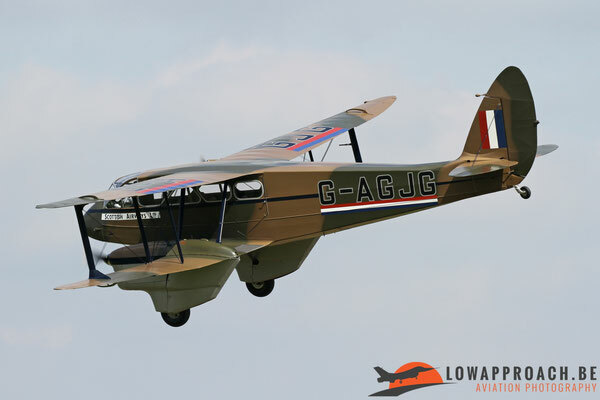 Not known to many is that in Belgium another 'Lizzie' is as good as airworthy, it made a number of flights in the past, and after a landing accident at Brussels Airport it was repaired, but its current status is unknown. This aircraft would be a very nice addition to the Belgian and European Warbird Scene. 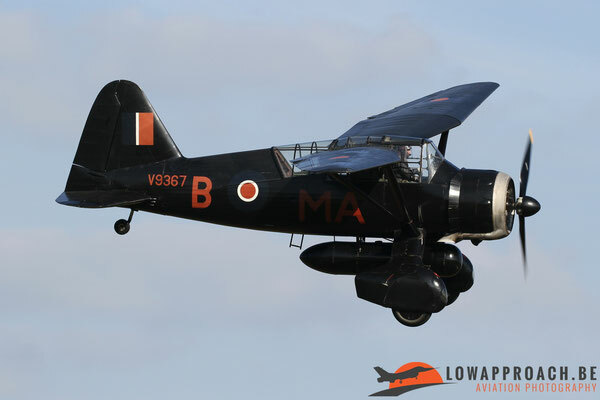 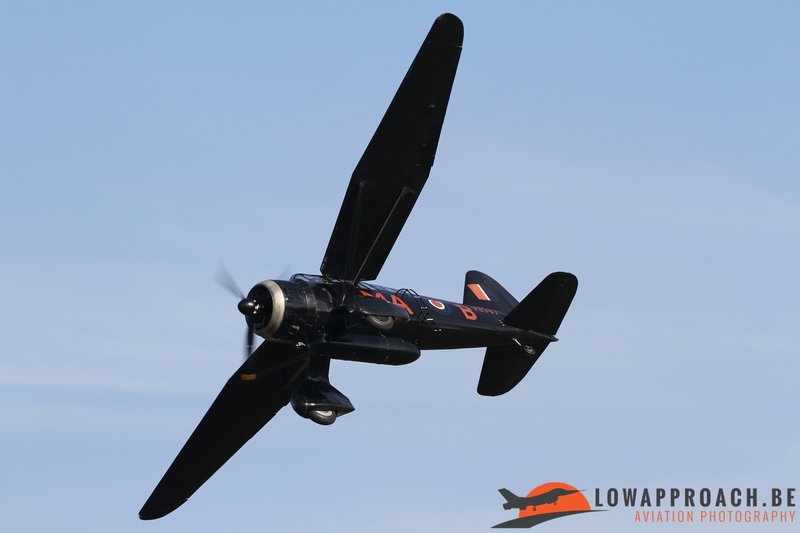 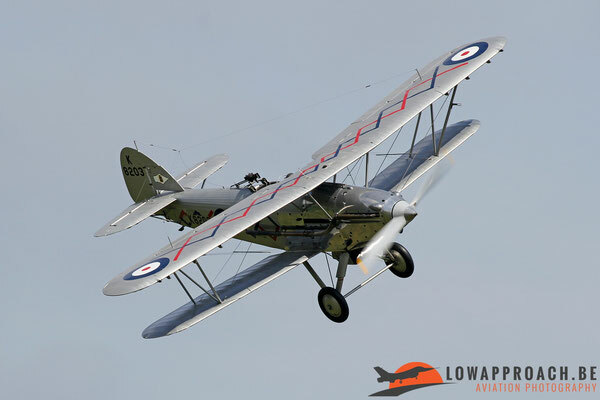 In addition a second Lysander is currently under restoration in Belgium for future display at the Brussels Air Museum. 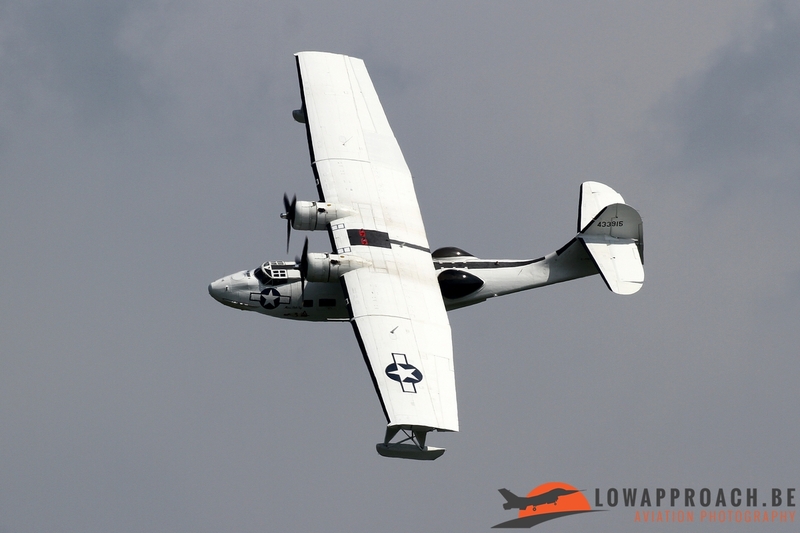 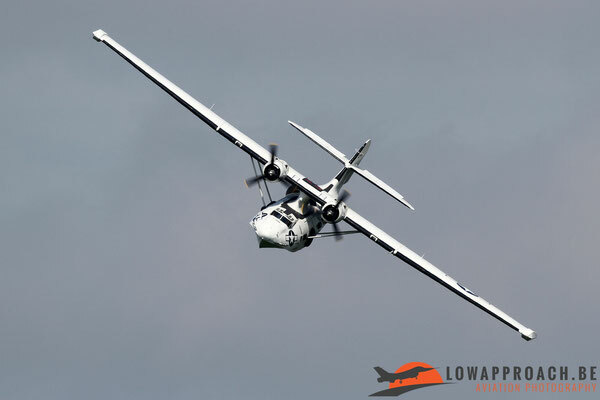 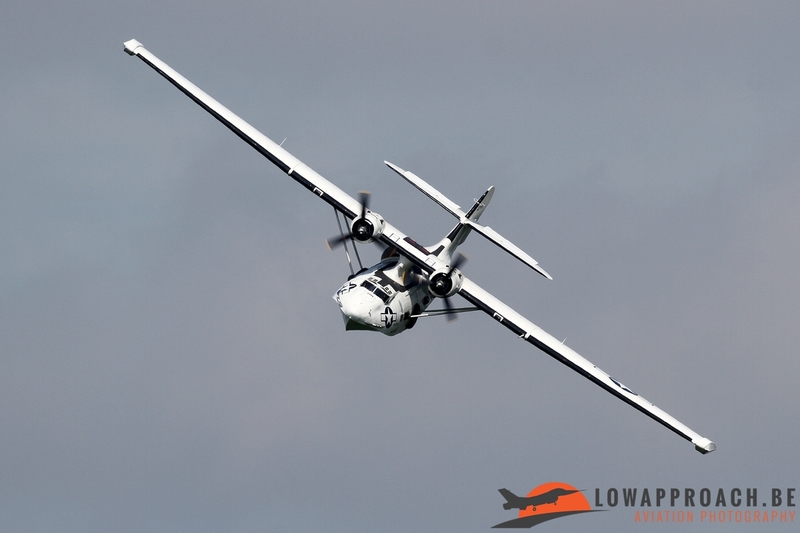 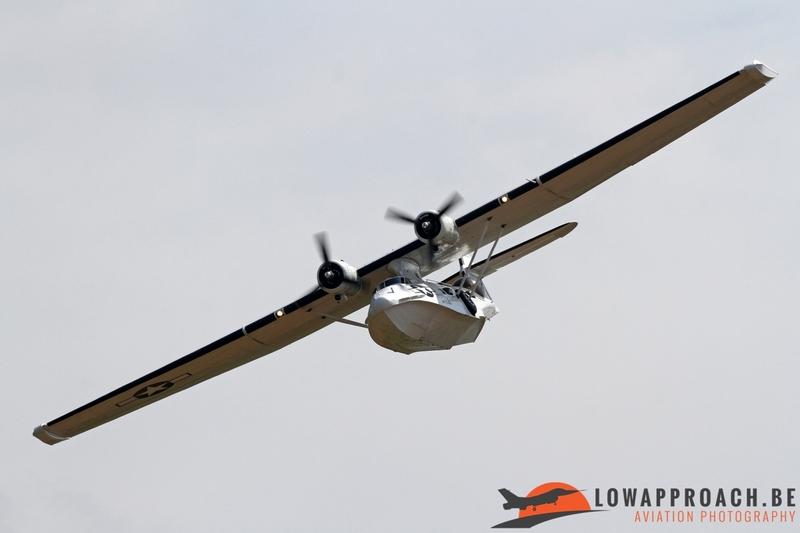 The final aircraft I want to put in the spotlight in this report is the well-known Canadian Vickers PBY5A Catalina from the Catalina Society. It brought a very spirited display to Old Warden and due to the size and orientation of the aerodrome some nice shots in the sun were possible. 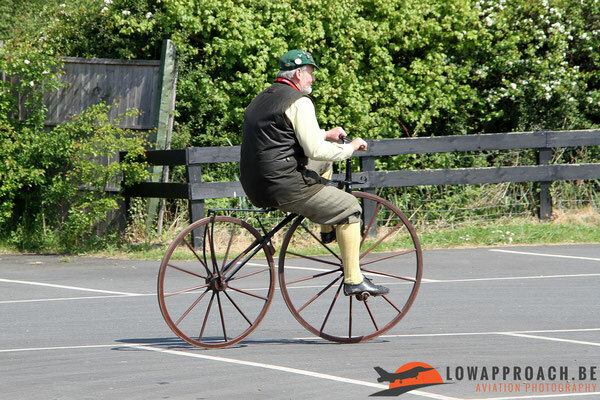 After the show the locals jumped on their bicycles and we boarded our coach for the trip back home,... although I must admit it was not the one on the picture. The aircraft presented in this report are only a small fraction of those that can be seen at Old Warden. They have also an extensive collection of smaller aircraft which virtually all are in airworthy condition. 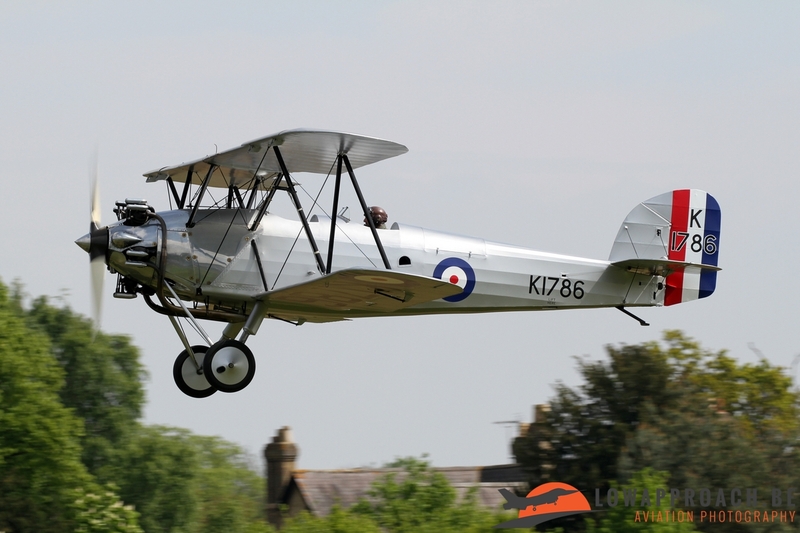 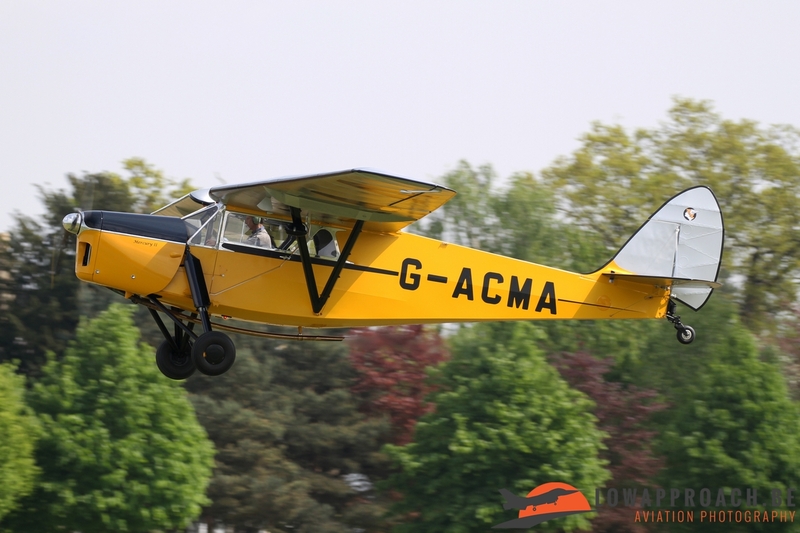 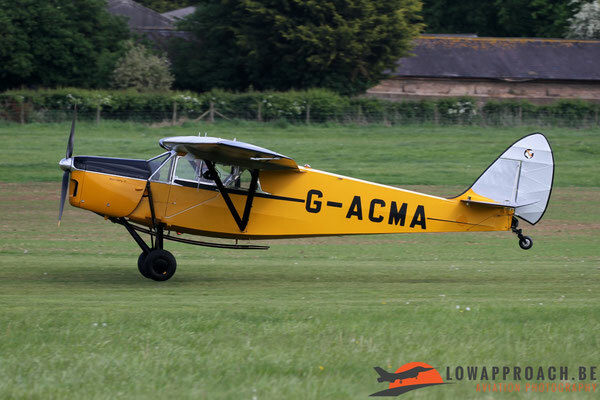 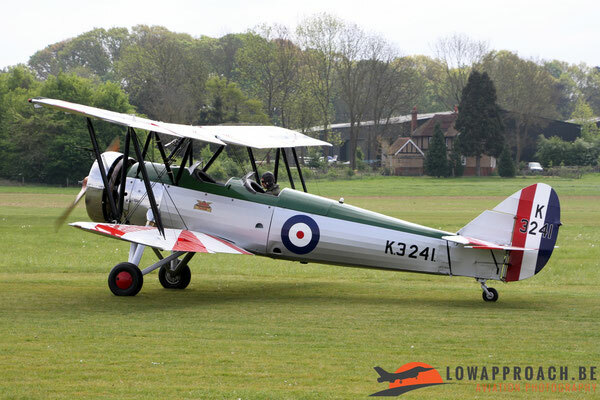 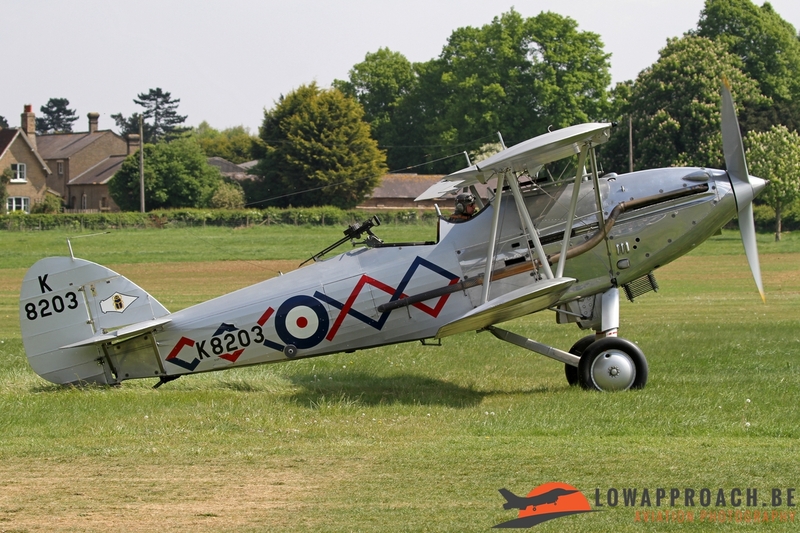 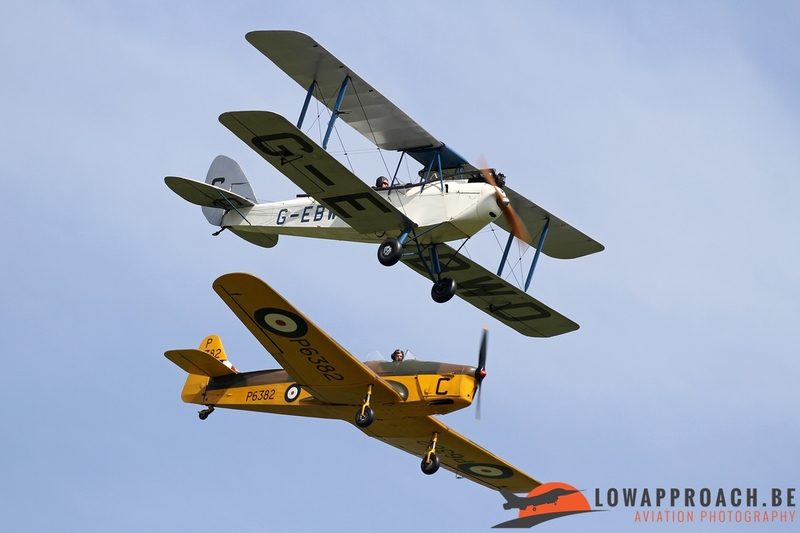 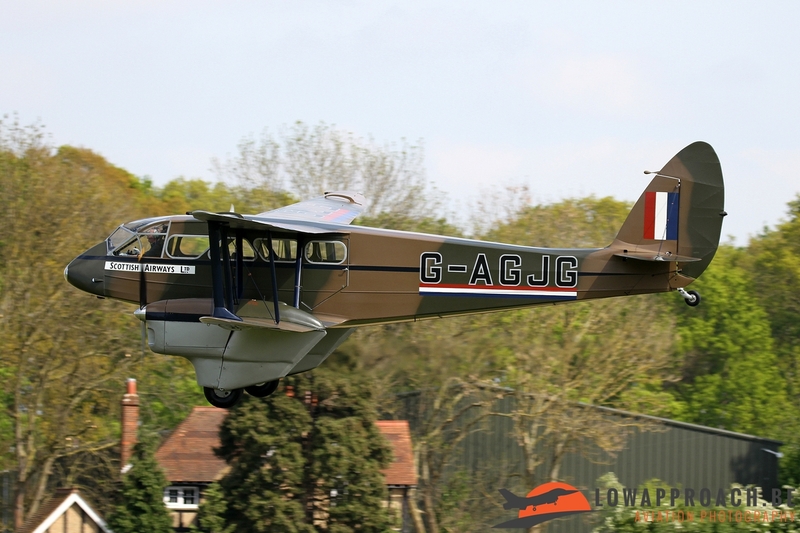 A visit to one of the many annual events at Old Warden is certainly worth the trip. 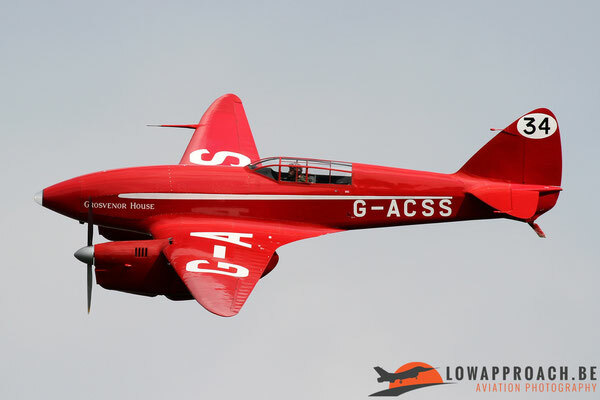 Apart from the aircraft and vehicles there is the possibility to visit the Swiss Garden or The House, so perhaps the perfect excuse to convince your wife to join you to a flying display.